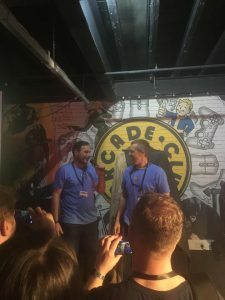 Home » Event » UK Reveal Recap! 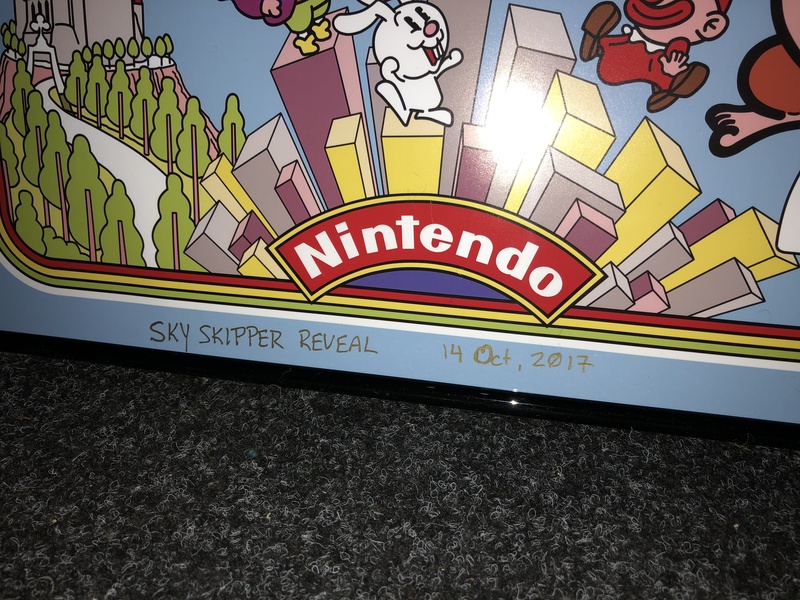 It’s odd how the mind works..even though October 2017 feels like it was just a month or so ago, the calendar says otherwise. 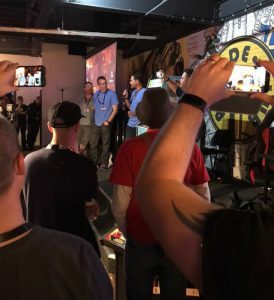 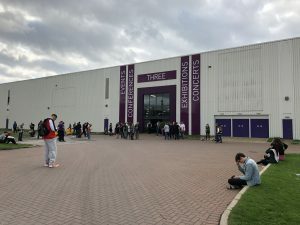 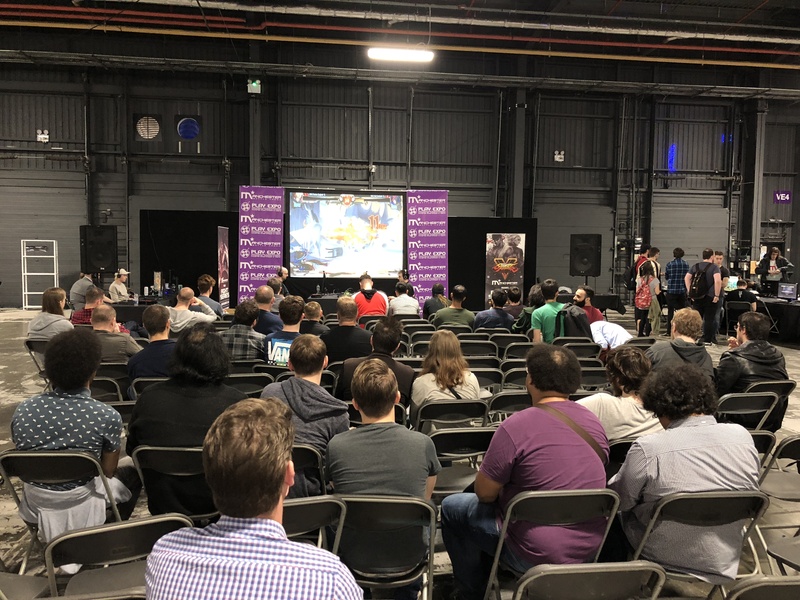 I was reminded of the same several weeks back when a stream of TBT tweets from the Southern-Fried Gaming Expo posted some pics from the US reveal event, and it was a stark reminder that we needed to get the UK reveal event up on the project website, as time had gotten away from us! 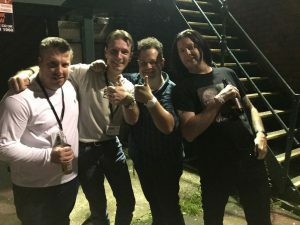 Alex was the consummate host and took very good care of me and my family over the course of our entire visit in the UK. 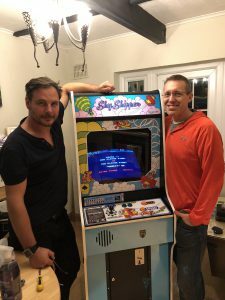 By the time we arrived in London and made our way to Alex’s house, almost all of the big work had been completed. 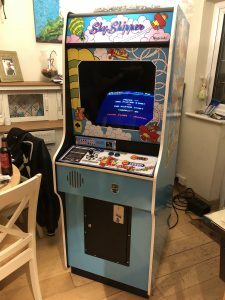 Alex did a fantastic job with the cabinet restoration and getting the artwork applied. 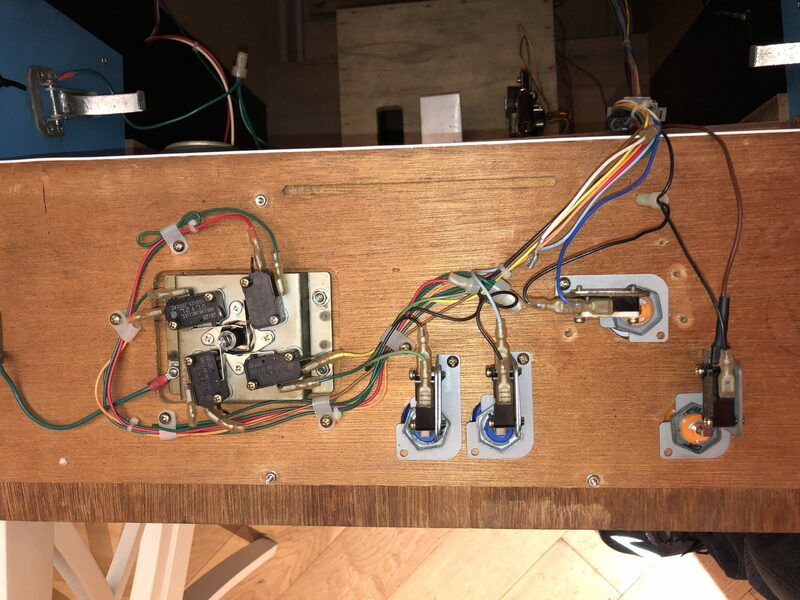 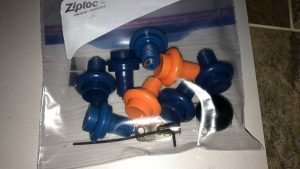 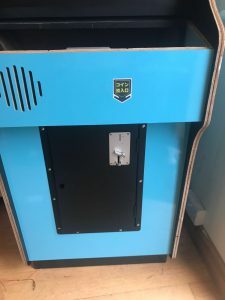 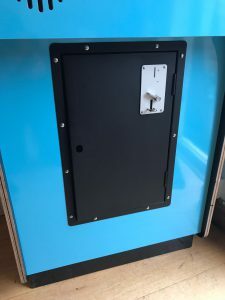 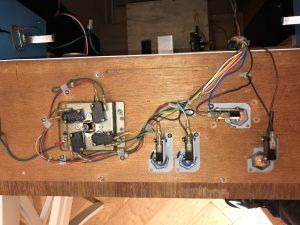 All we were missing were a few items that we had previously discussed (some new buttons, joystick ball top and new 8-way restrictor plate, finishing up some wiring in the back, etc.) 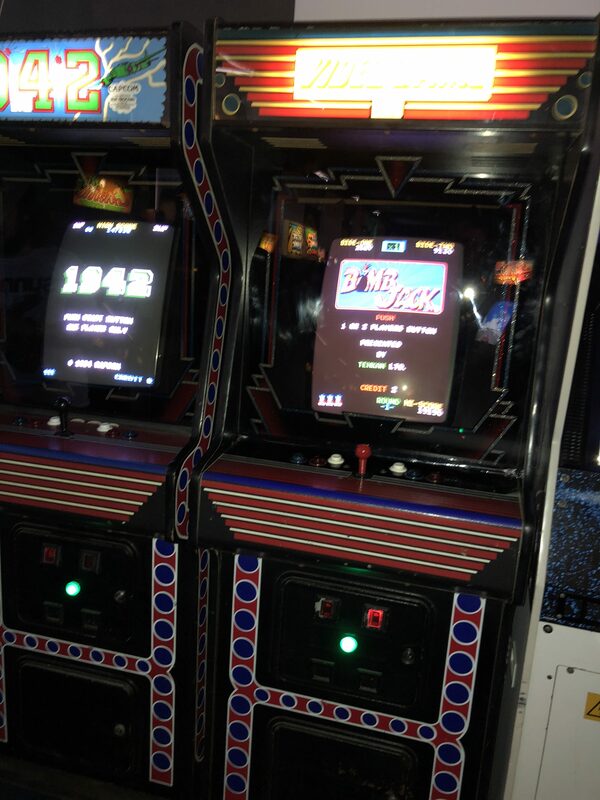 and we got right to sorting those as soon as we hit his doorstep. An hour or so later and we called it ‘job done’ and took a few minutes to enjoy the fruits of our labor. Once we had the machine powered on and were comfortable with it being reliable and ready for the reveal event, we wrapped it up and set it to the side. 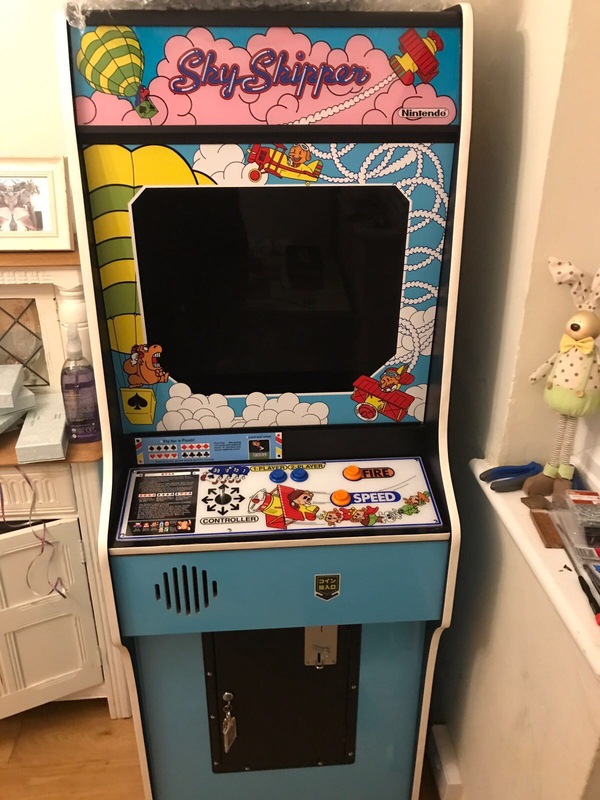 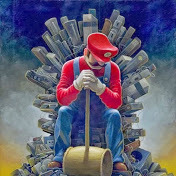 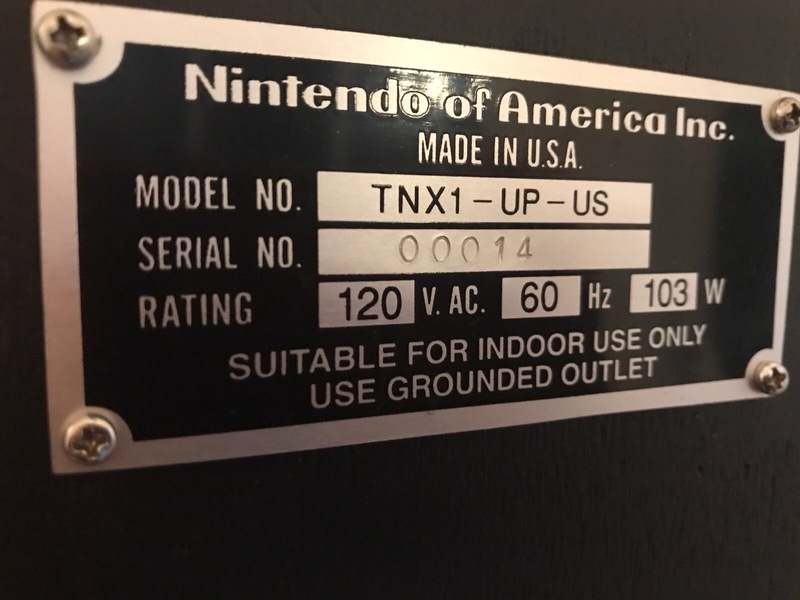 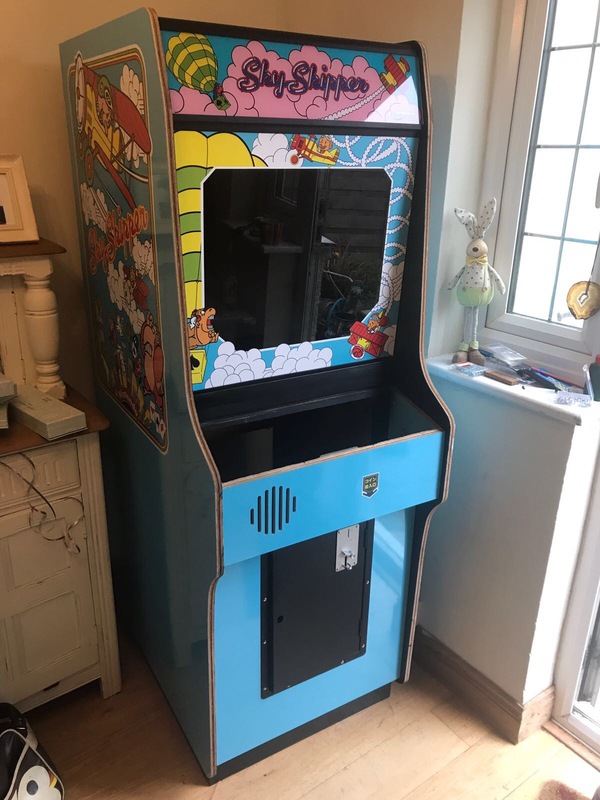 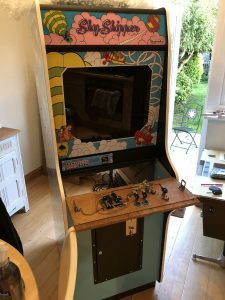 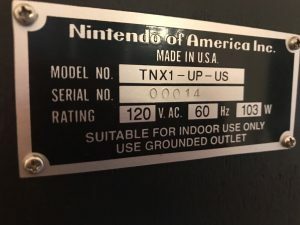 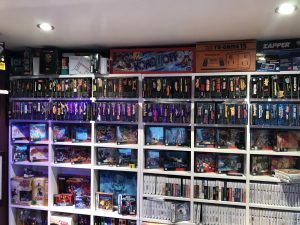 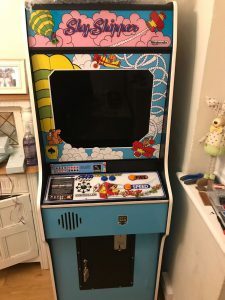 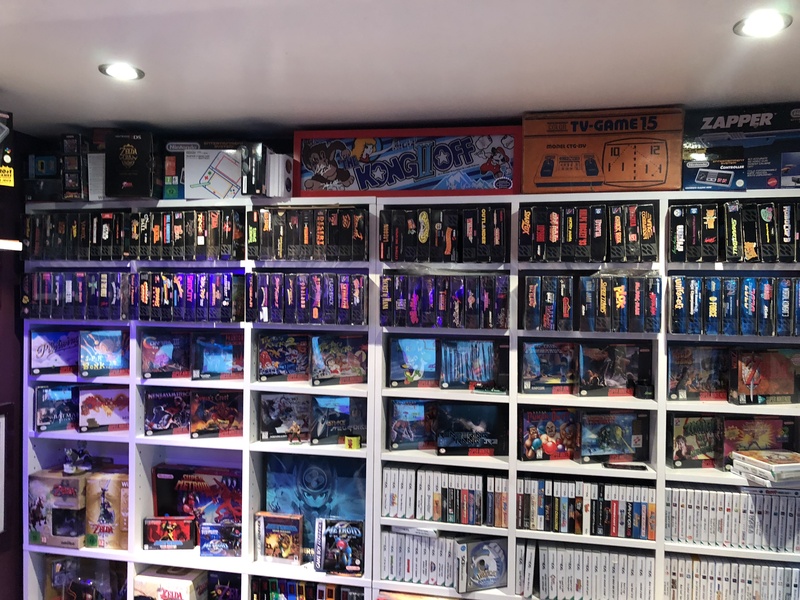 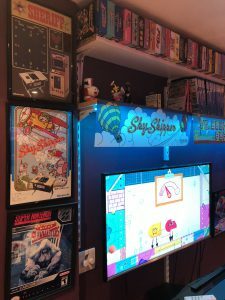 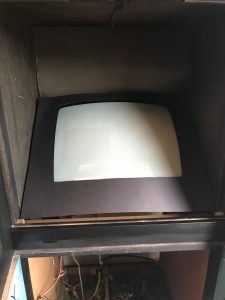 Alex then took me out to his gamesroom in his garden and there I got to see a very impressive collection of console games (focusing mainly on SNES) and one of the nicest examples of ‘rare’ Nintendo arcade history – an upright Sheriff. Alex turned it on and we played a few games and I’m here to say – it’s a hoot. 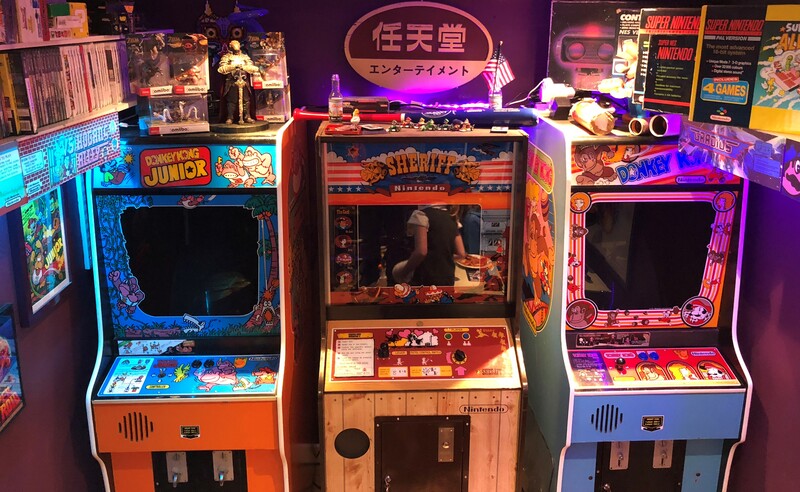 The whole gas-knob control of the Sherrif and the mechanics of the game are nothing short of fantastic.. it really feels like an arcade game should feel with the controls perfectly matching the mechanics of the gameplay. 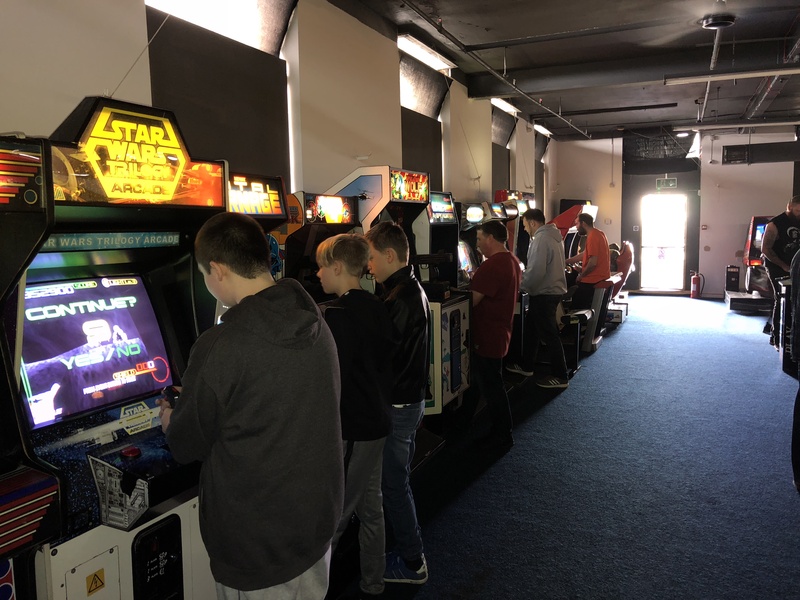 With everything finished and the game wrapped, it was time to have some fun before the big night at the Arcade Club. 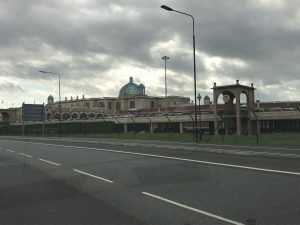 Alex went to get a Lorry (van) and we loaded Sky Skipper, packed up and started the trek north from Twickenham to Manchester and then on to Bury. 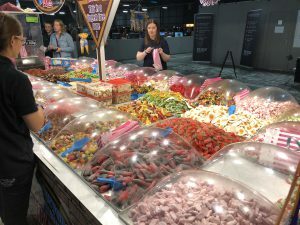 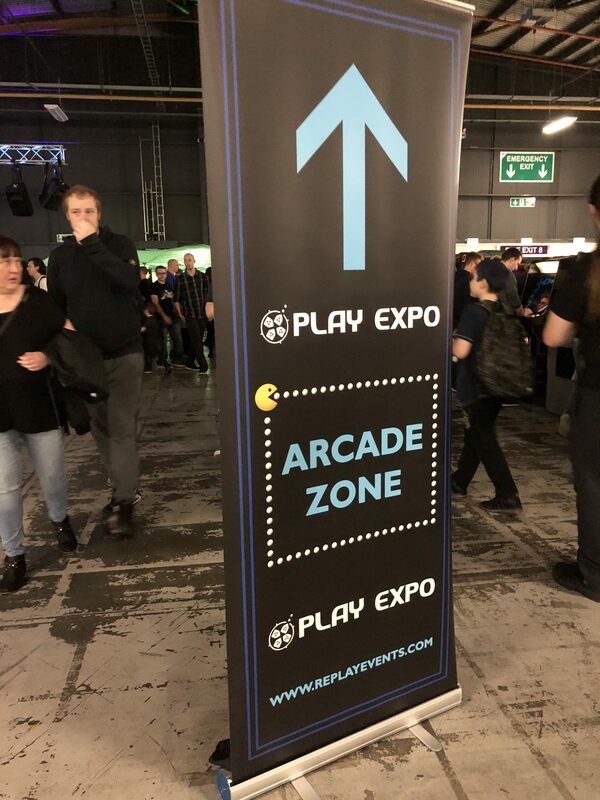 We had the afternoon available so we decided to ride over to the Play Expo (Manchester) and have some fun for a few hours. 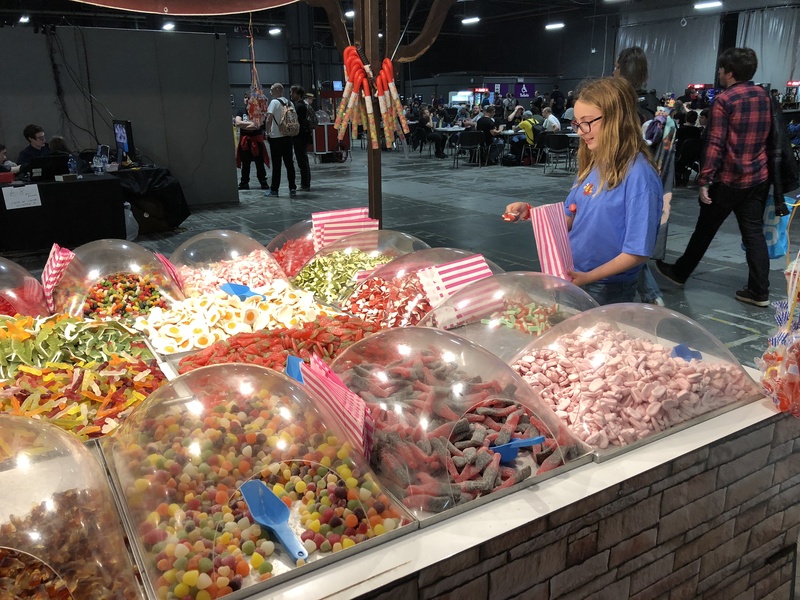 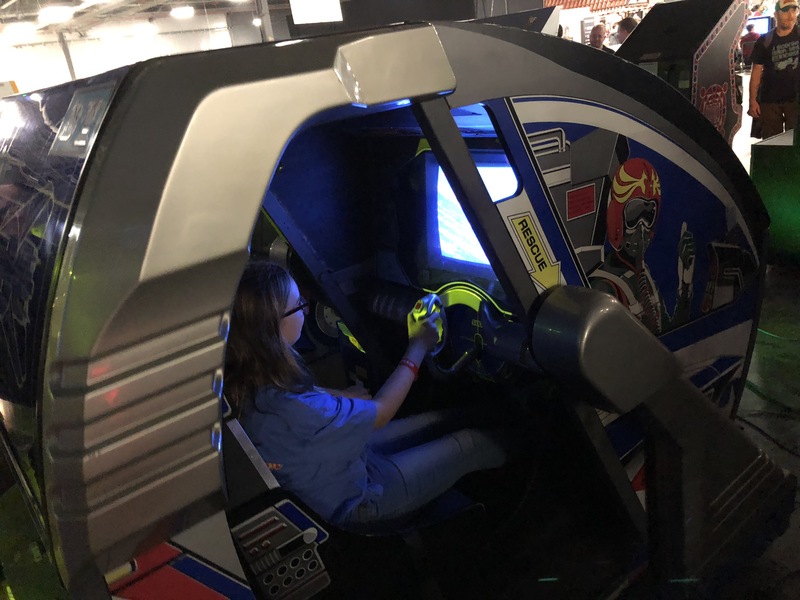 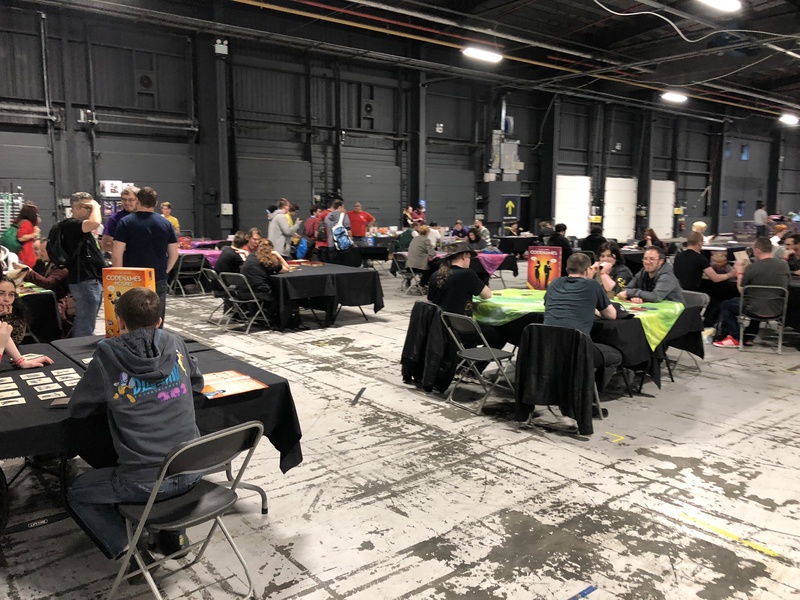 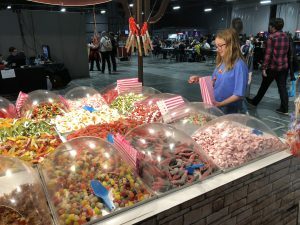 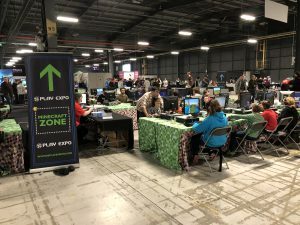 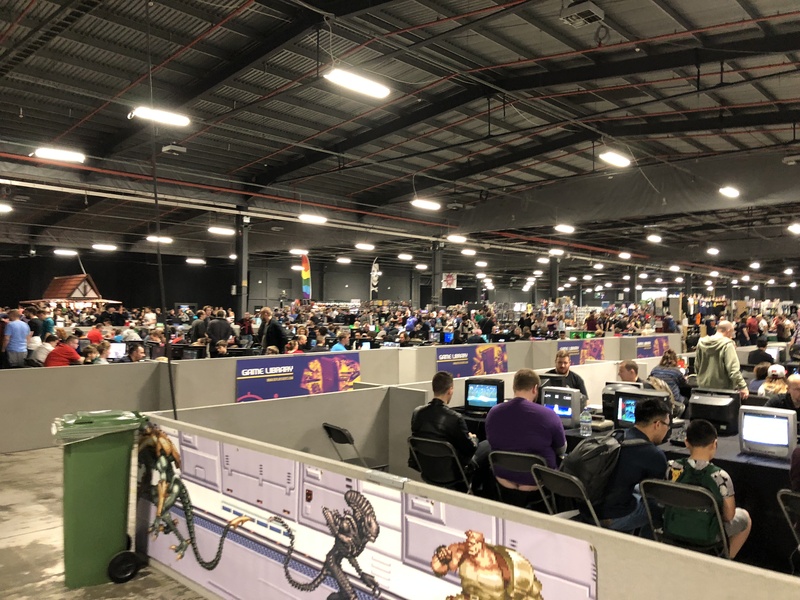 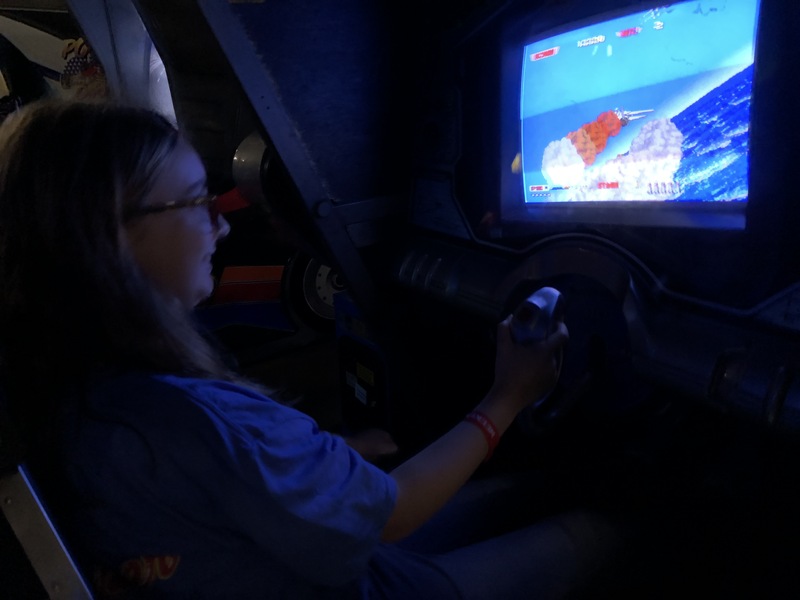 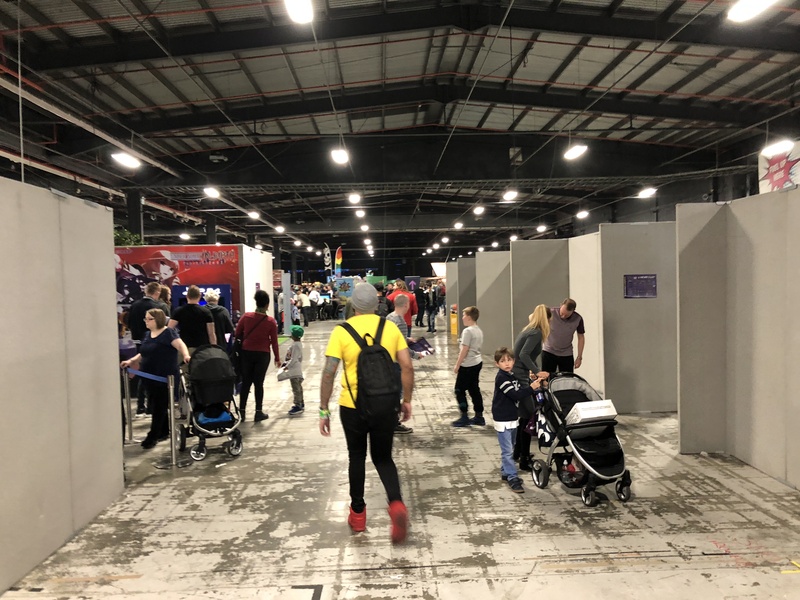 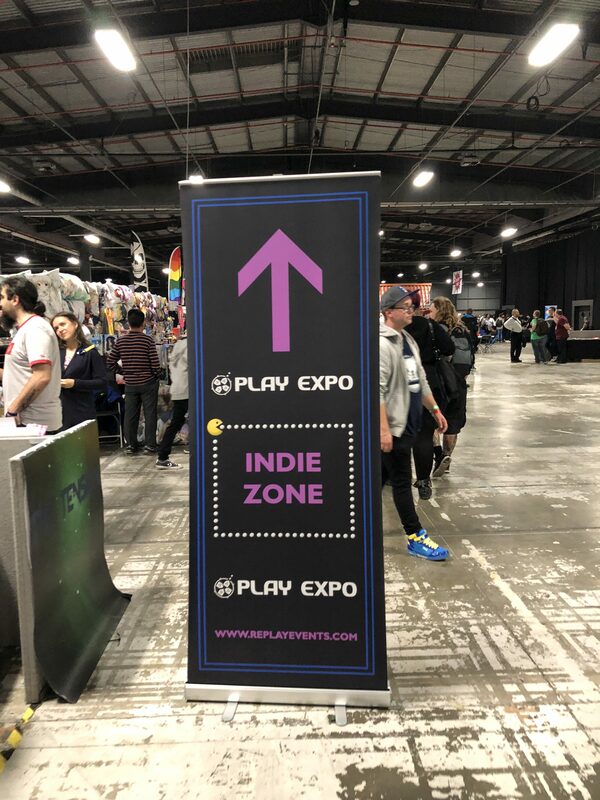 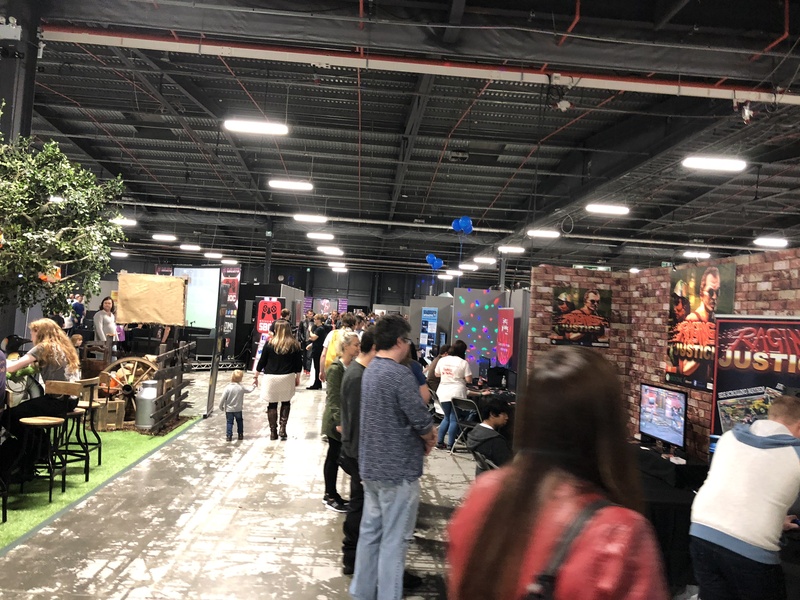 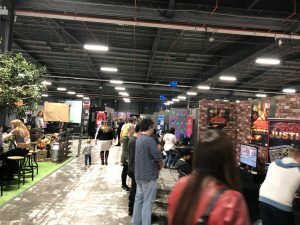 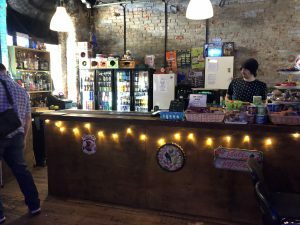 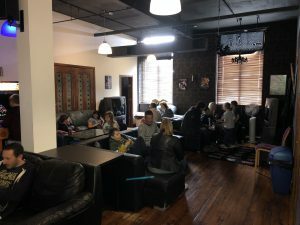 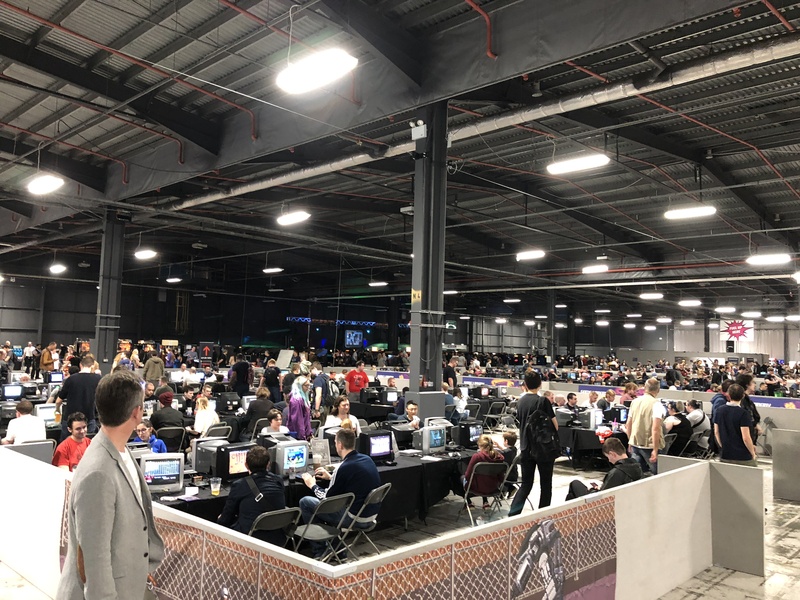 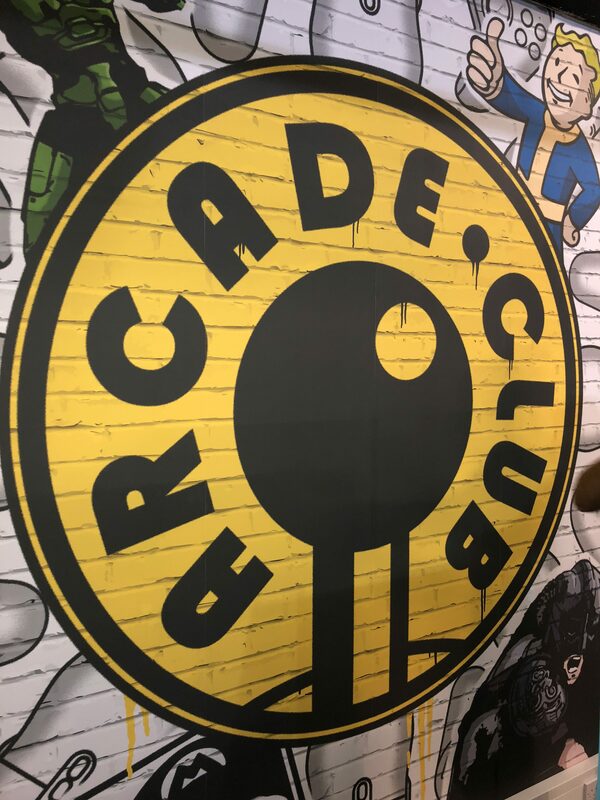 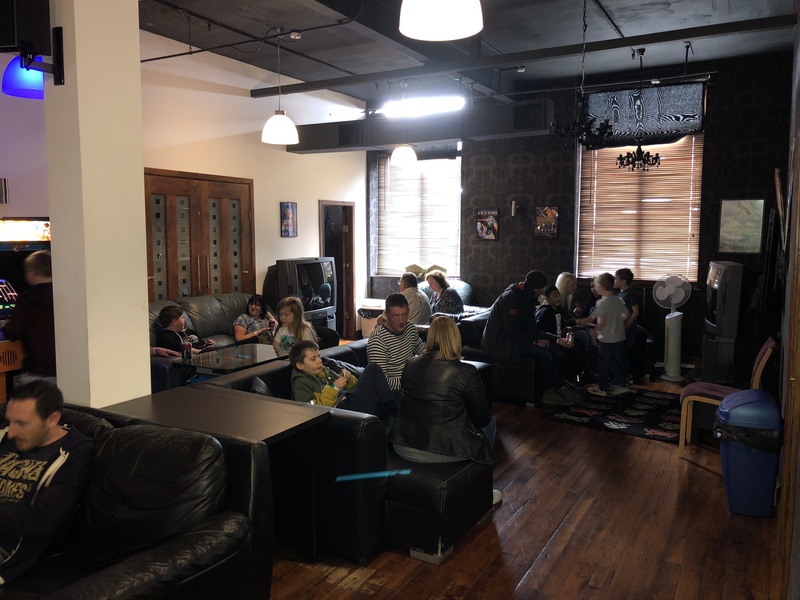 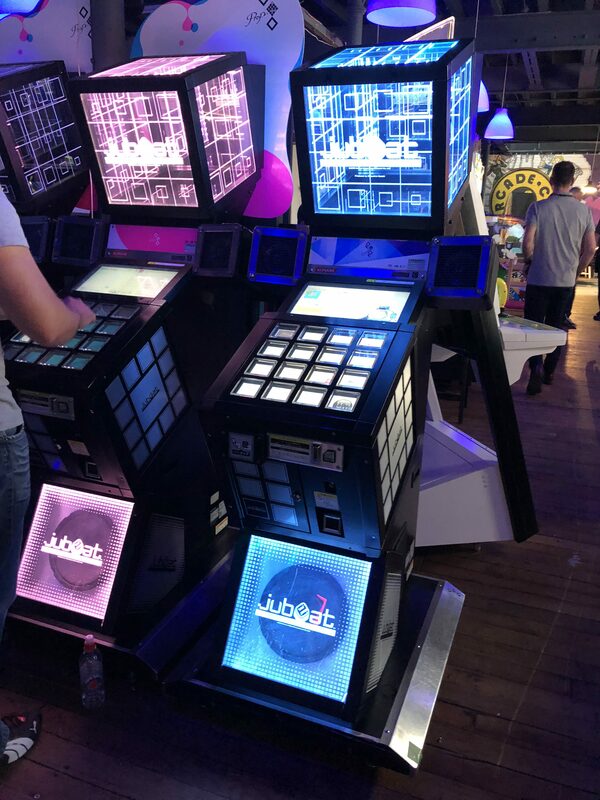 I loved the inclusiveness of this event – there was everything from Minecraft to Retro/Modern console to boardgames to Classic Arcade & Pinball and they were each set up in their respective “zones”. Made for a very clean layout and people tended to gravitate to the areas that interested them most, and it actually helped out with crowd control. I was ran into Shaun Holley from the 10 Pence Arcade podcast and friend of the project Peter “K-Man Sweden” who came up just for the reveal!! 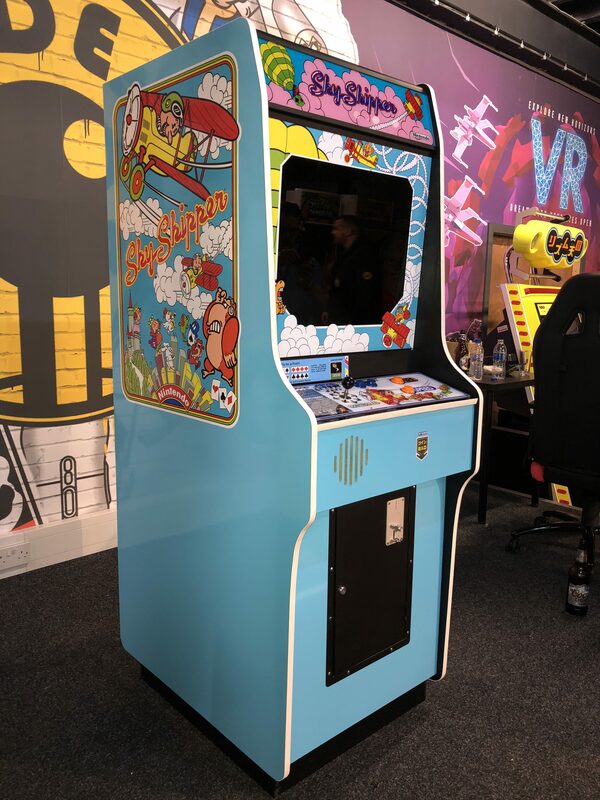 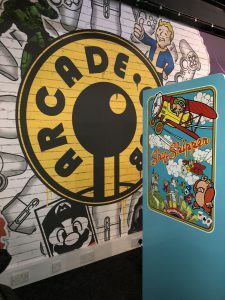 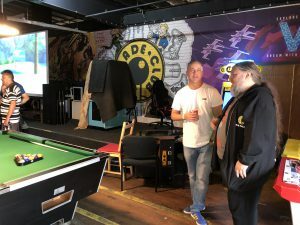 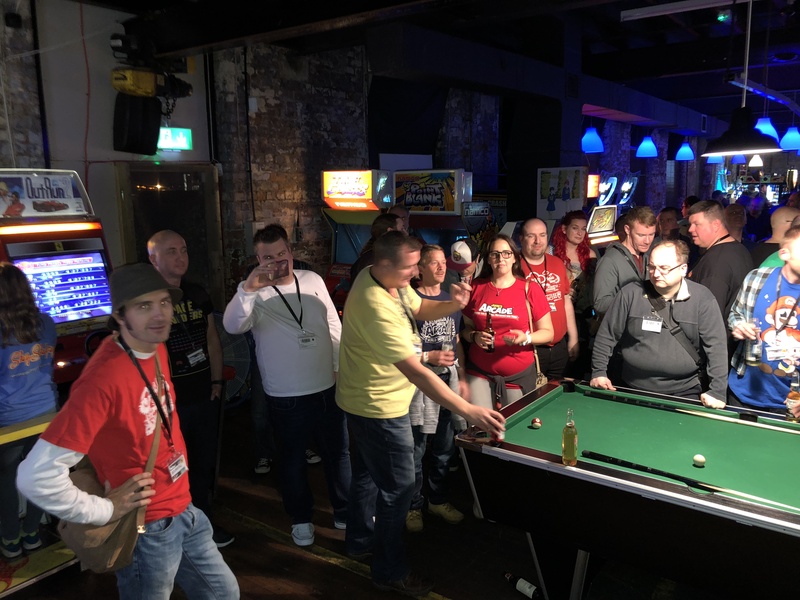 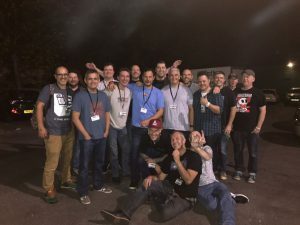 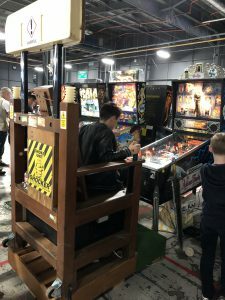 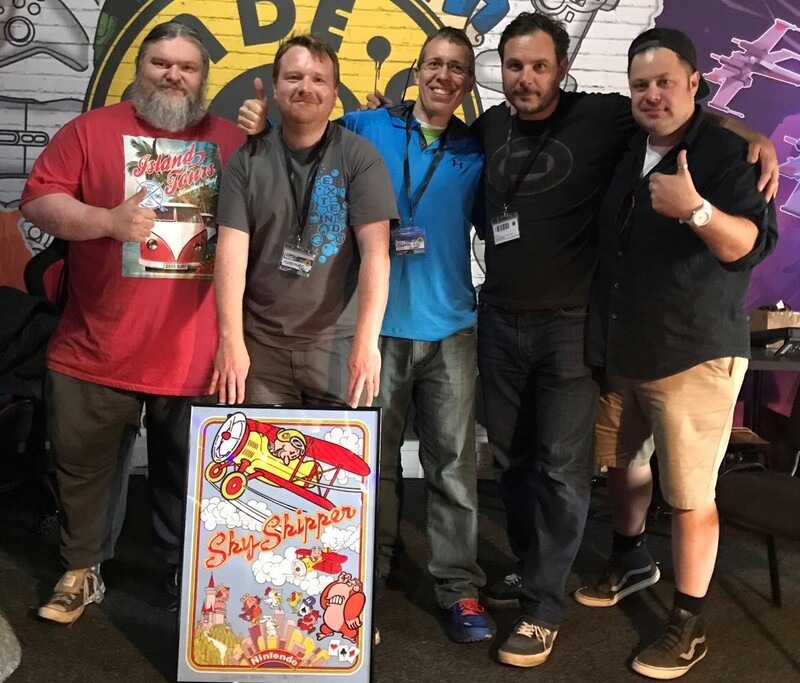 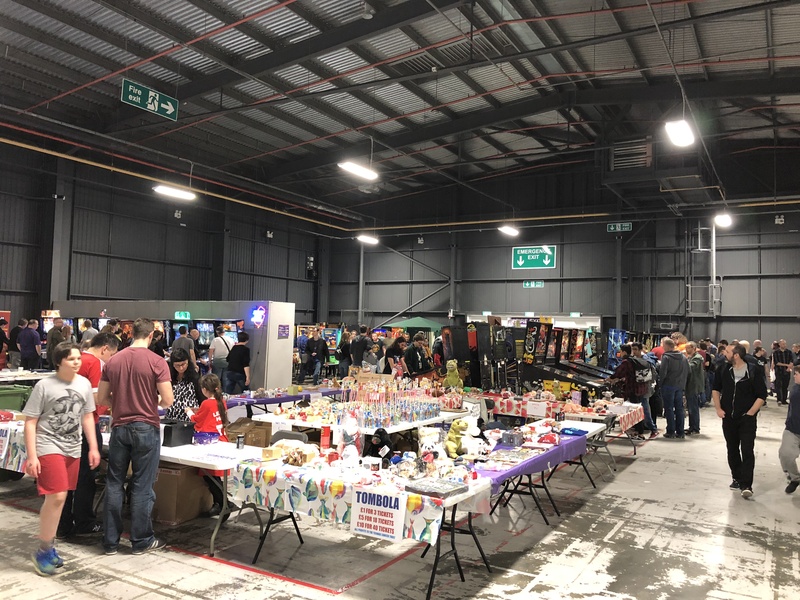 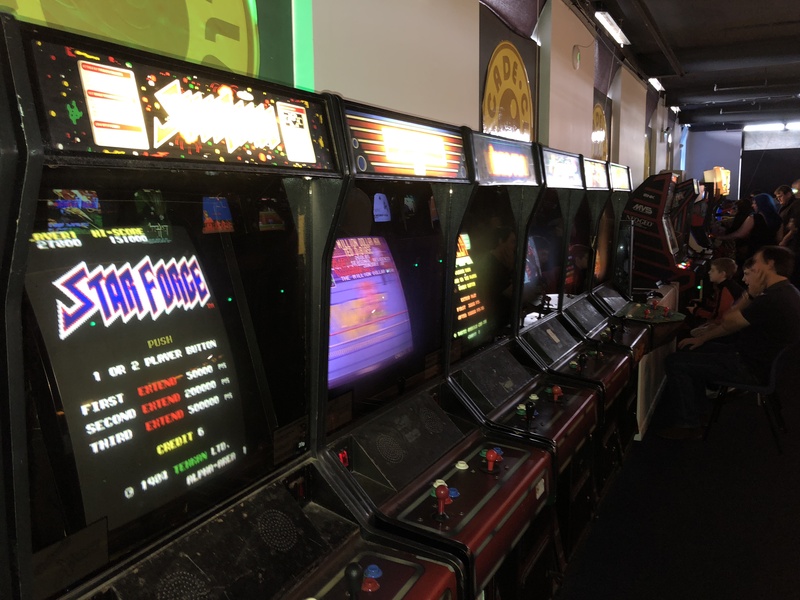 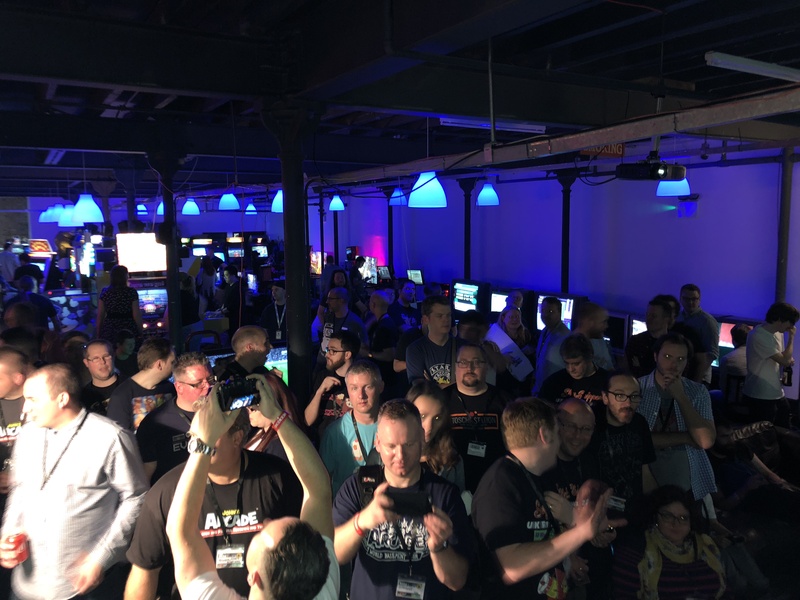 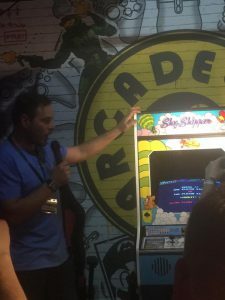 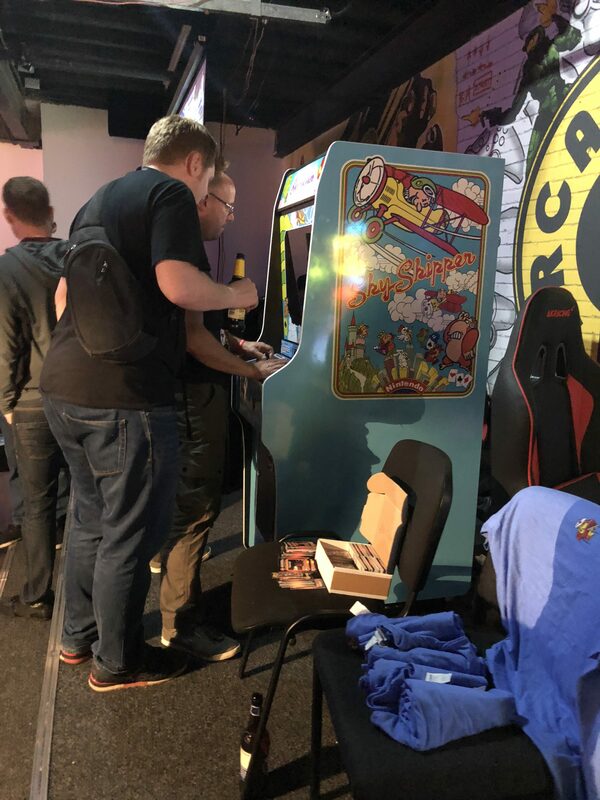 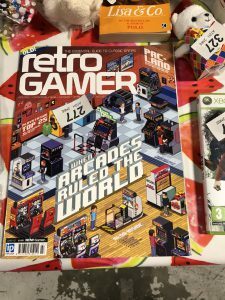 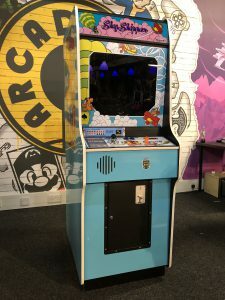 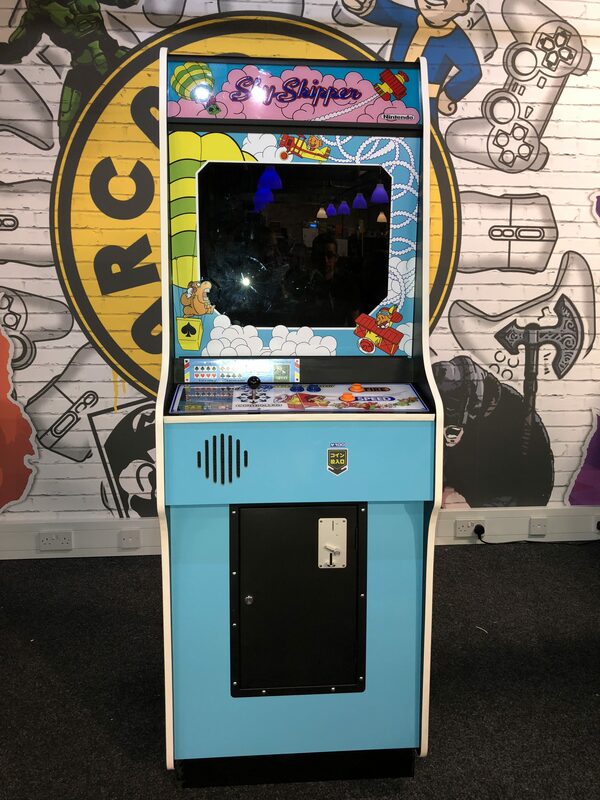 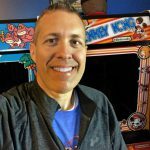 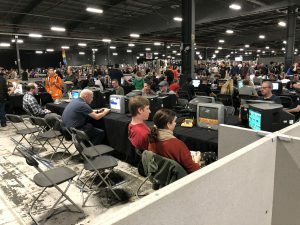 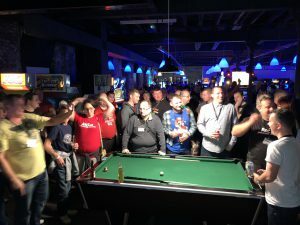 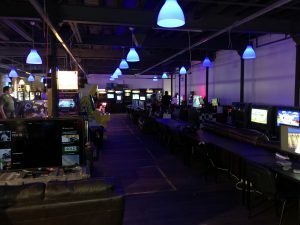 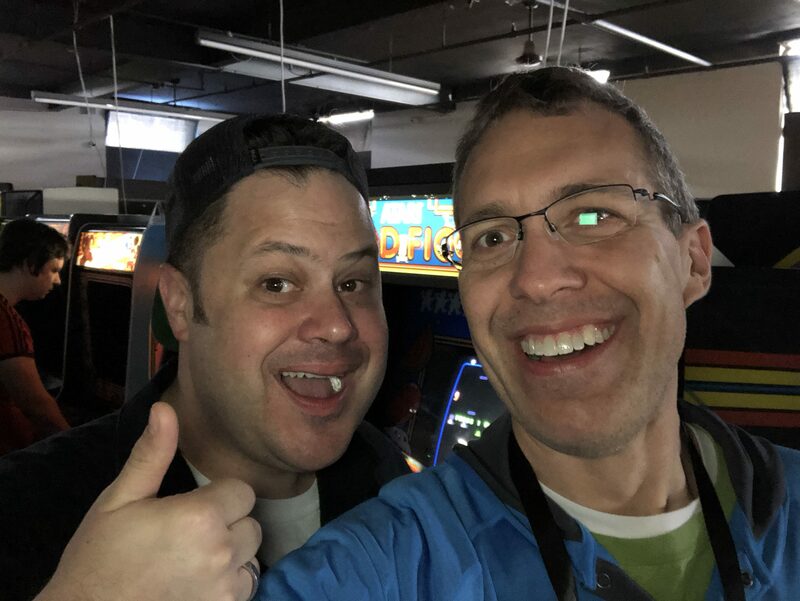 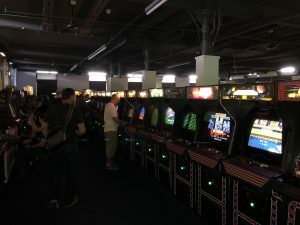 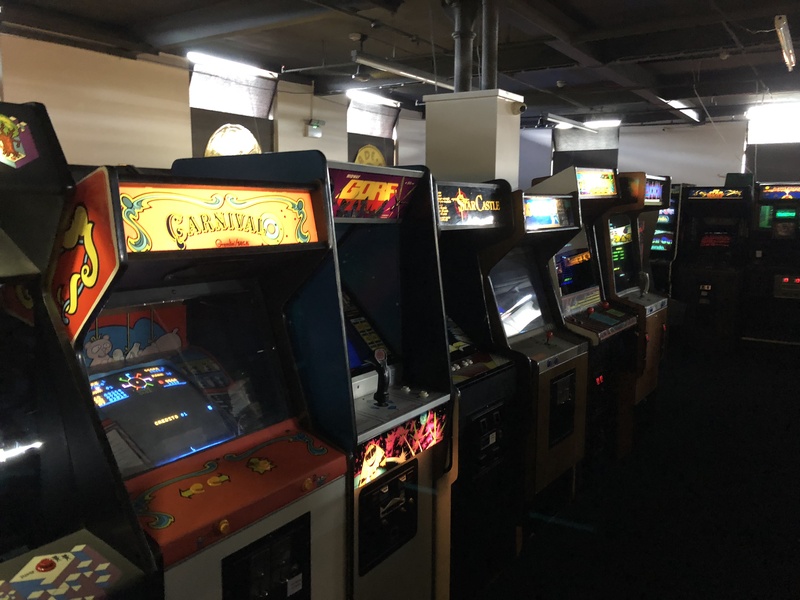 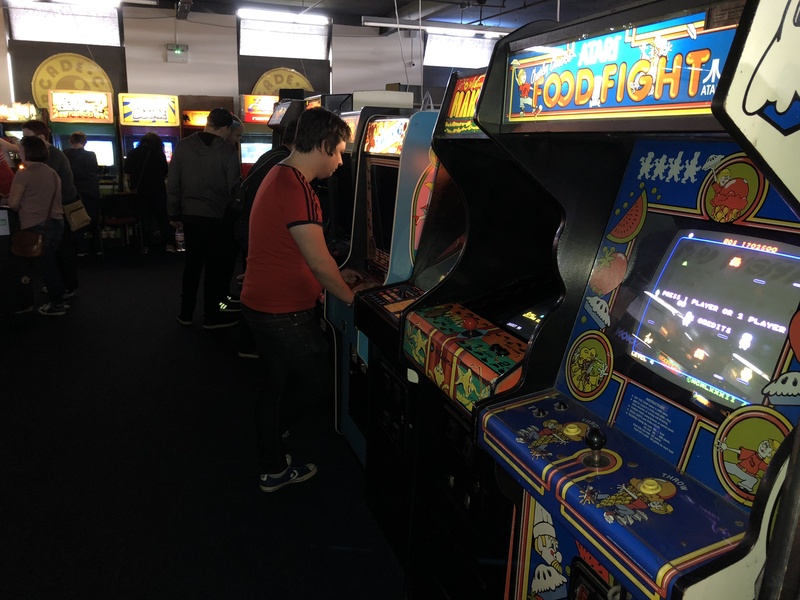 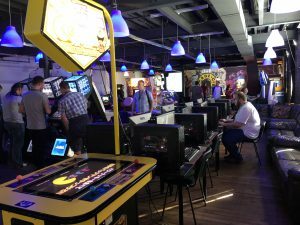 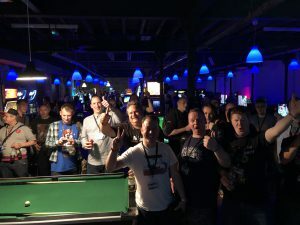 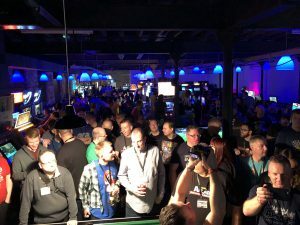 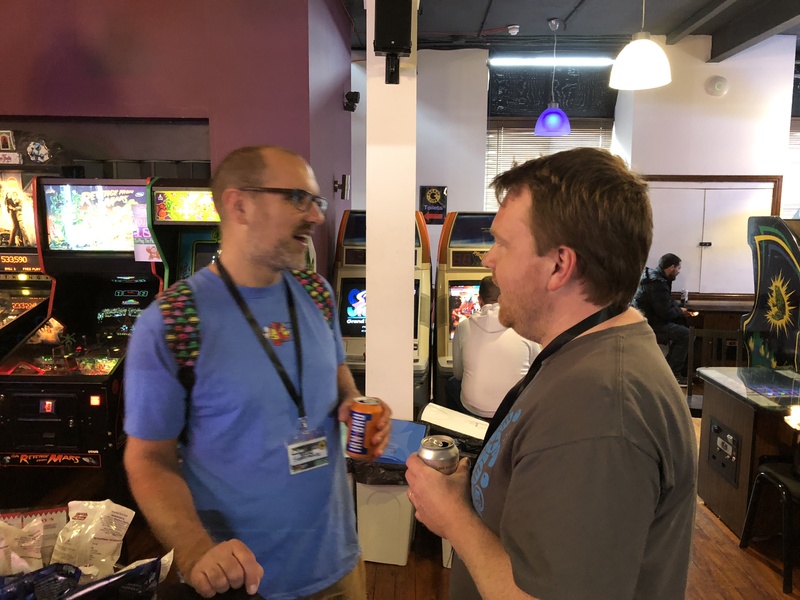 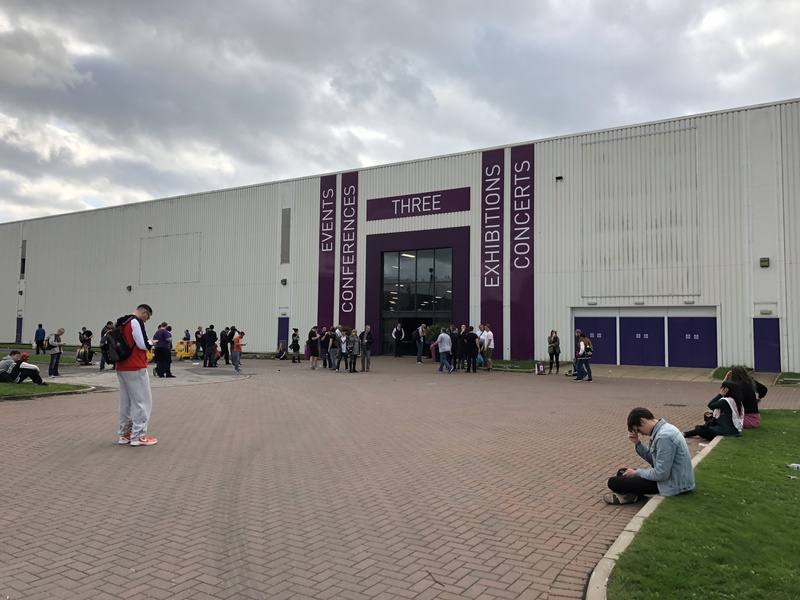 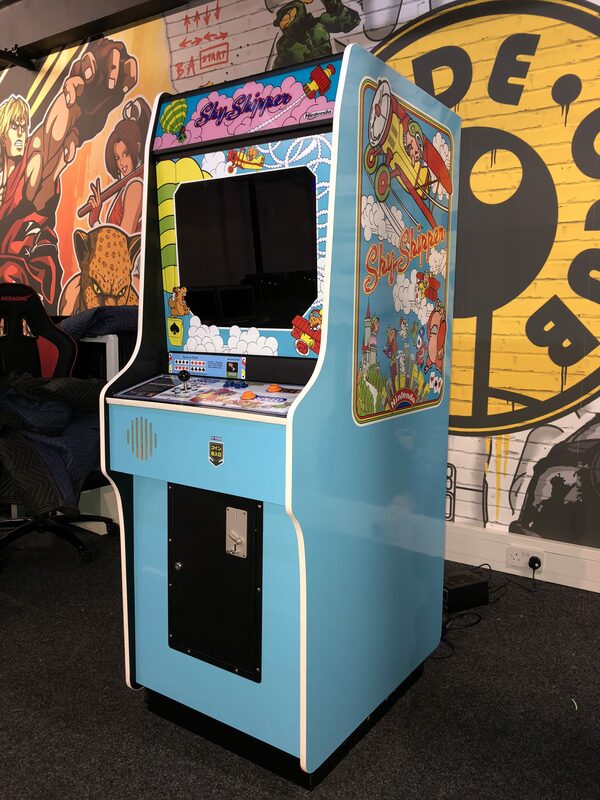 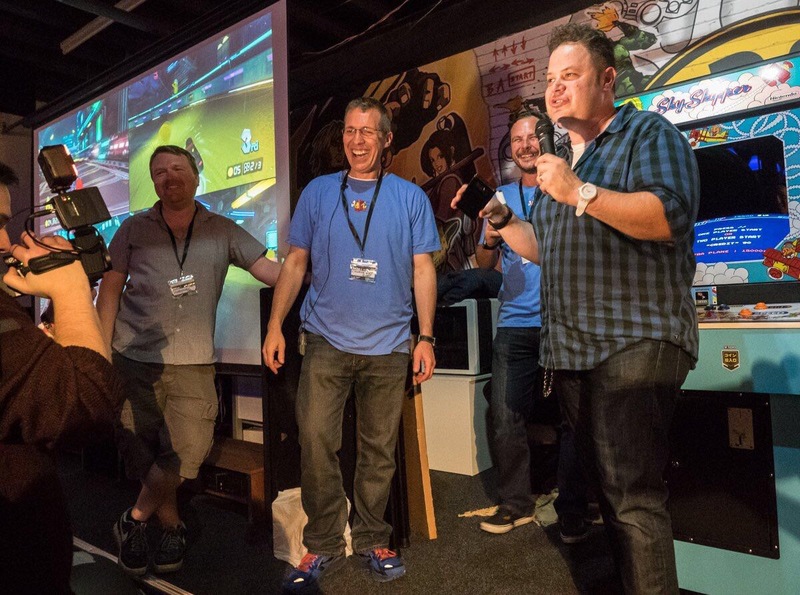 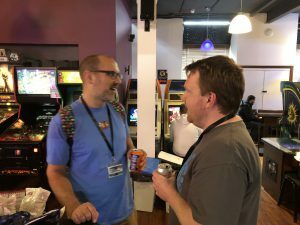 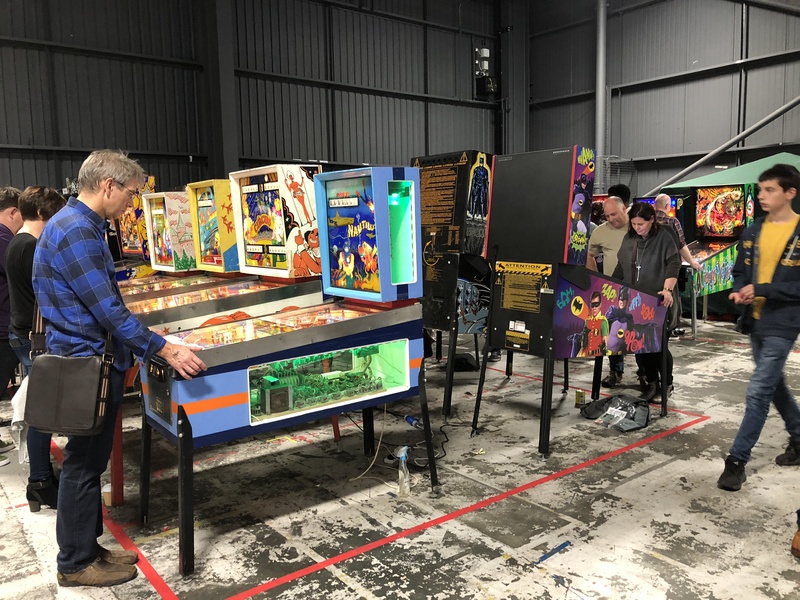 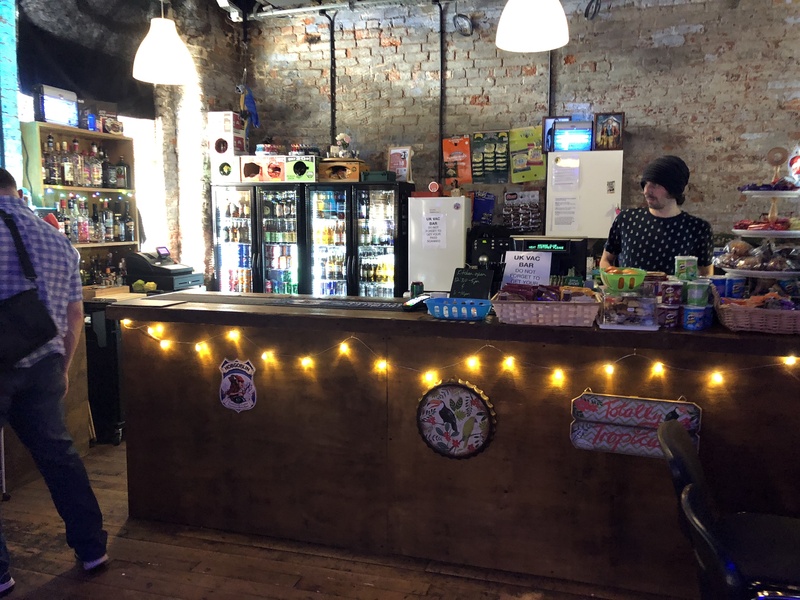 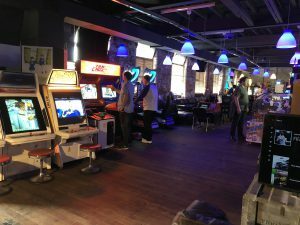 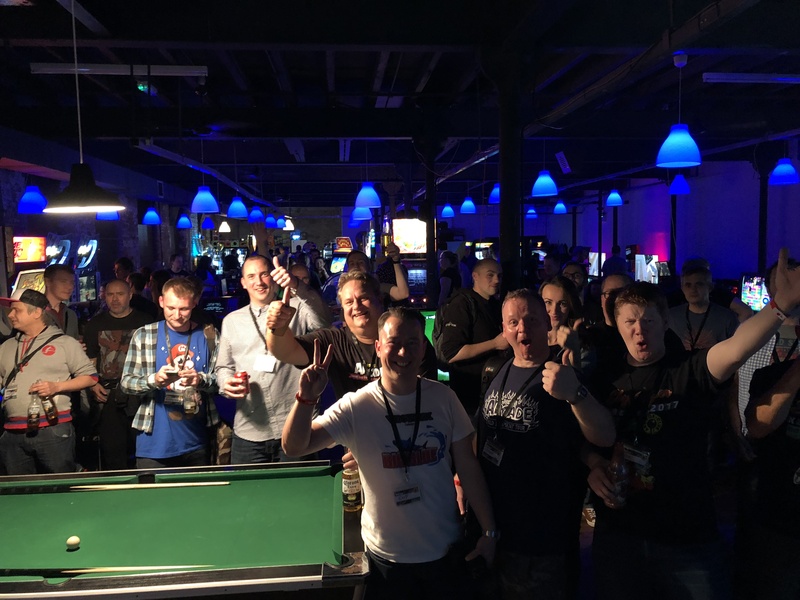 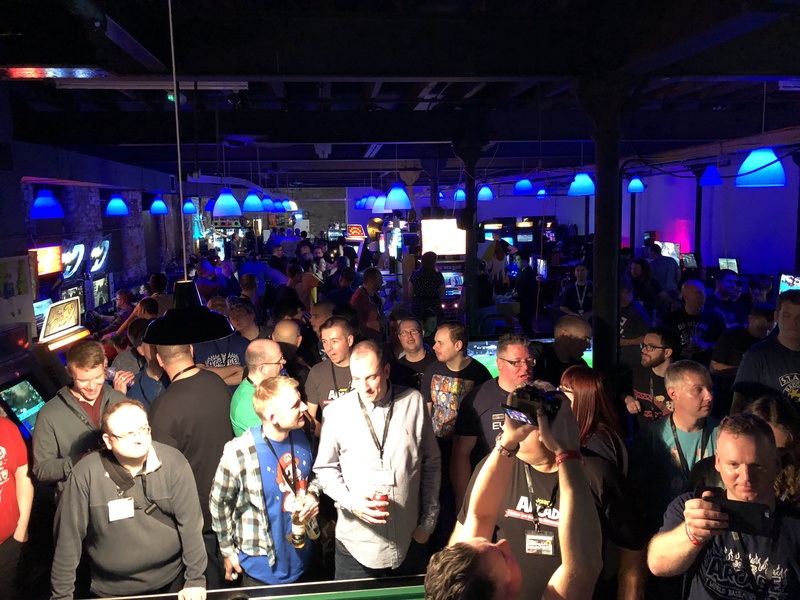 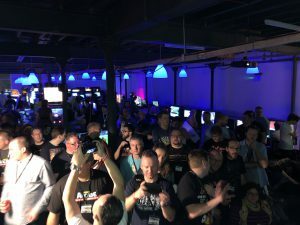 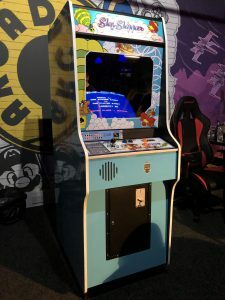 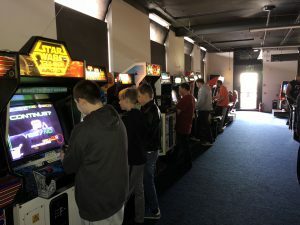 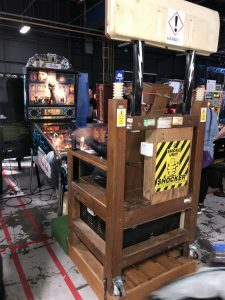 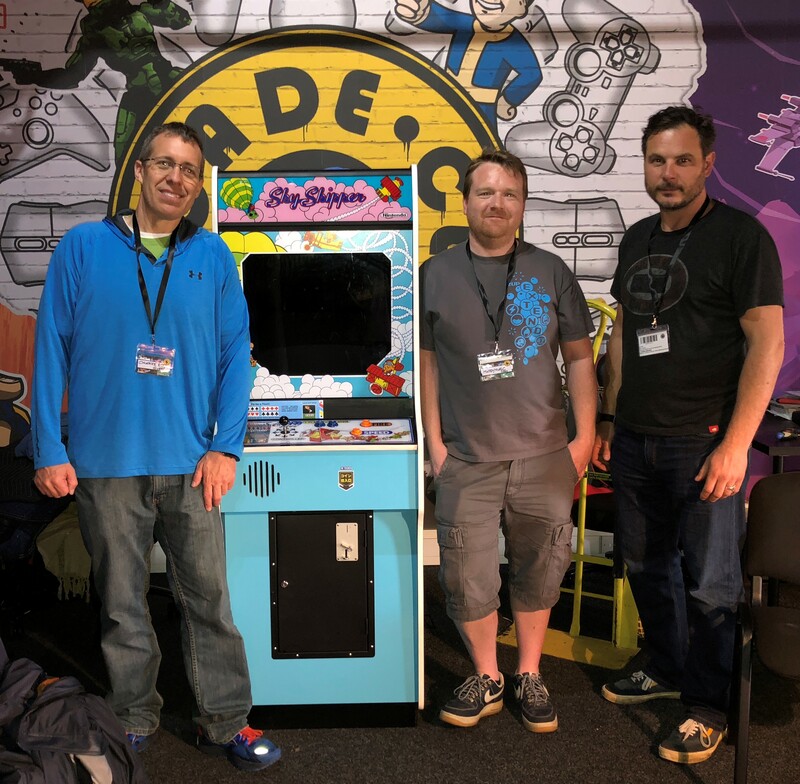 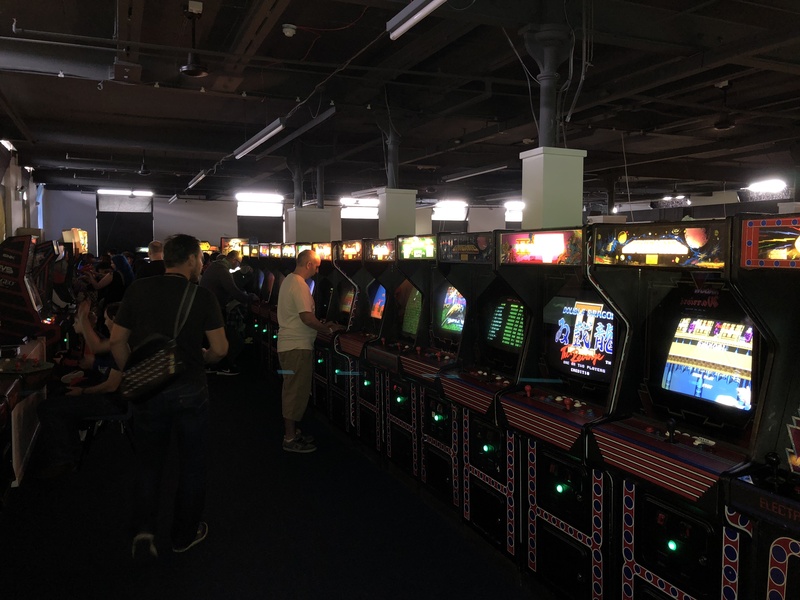 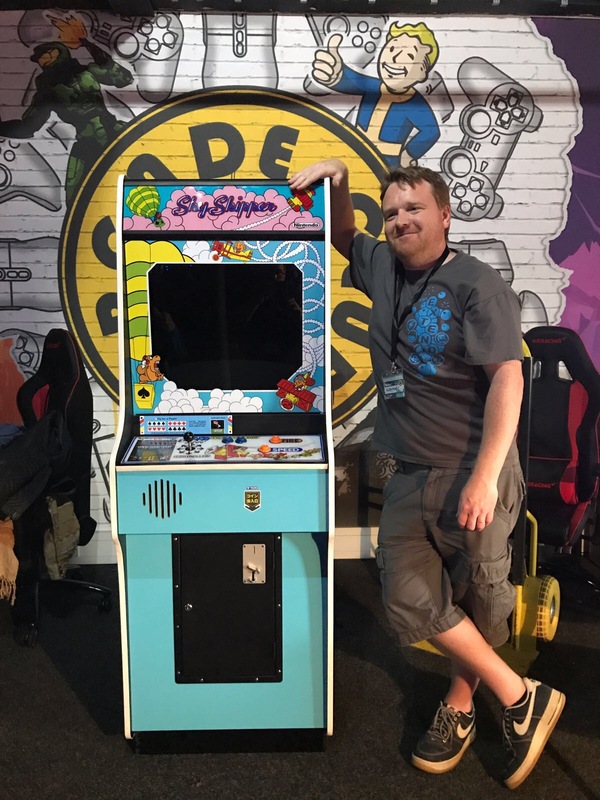 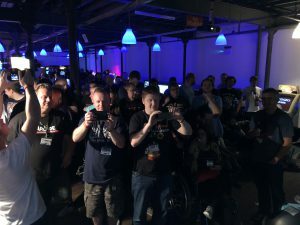 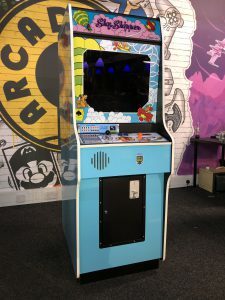 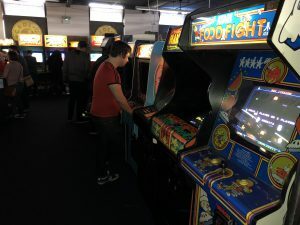 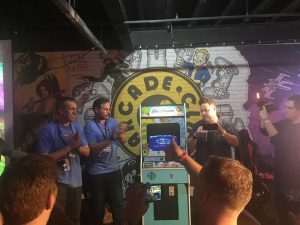 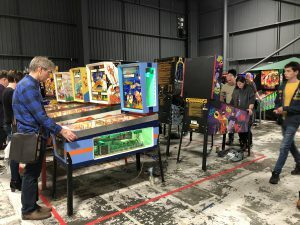 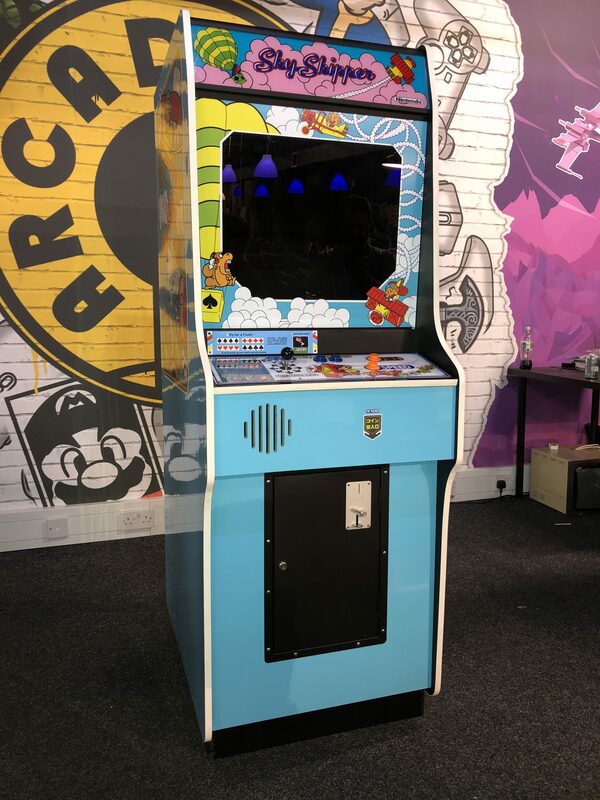 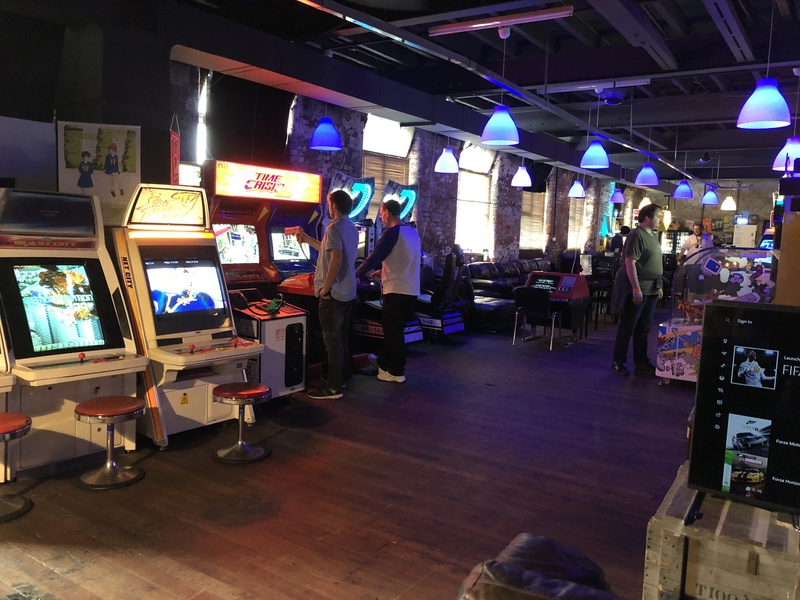 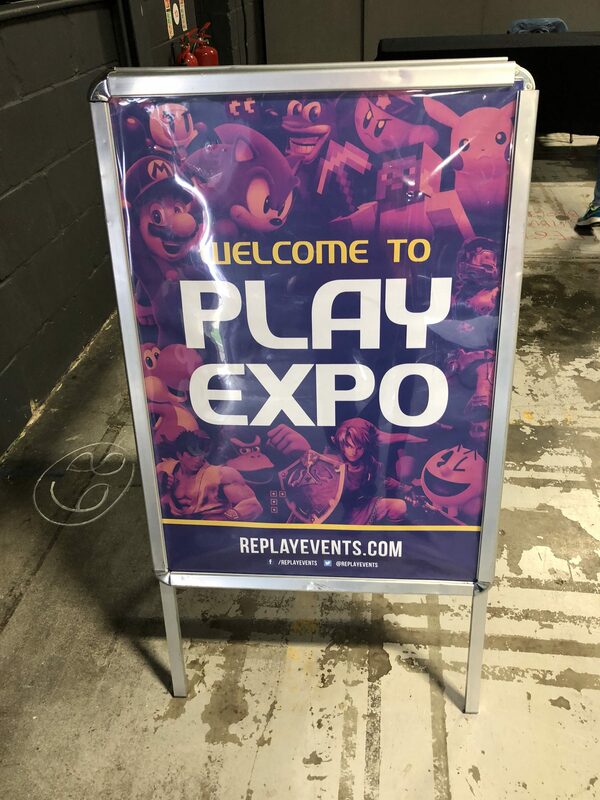 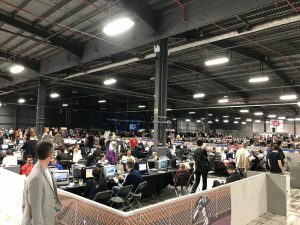 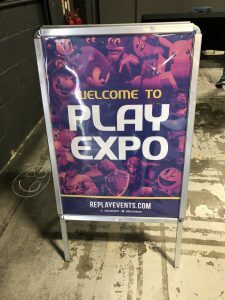 Check out Alex and John Jacobson’s (blkdog7)’s walk-through of the event and interview with James Brindle (Retro Games Party) to learn more about his involvement with Play Expo and how it supports the retro gaming scene in the UK! 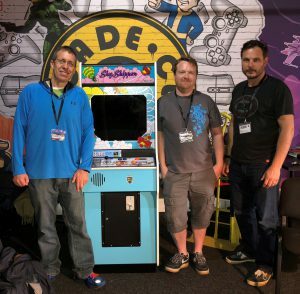 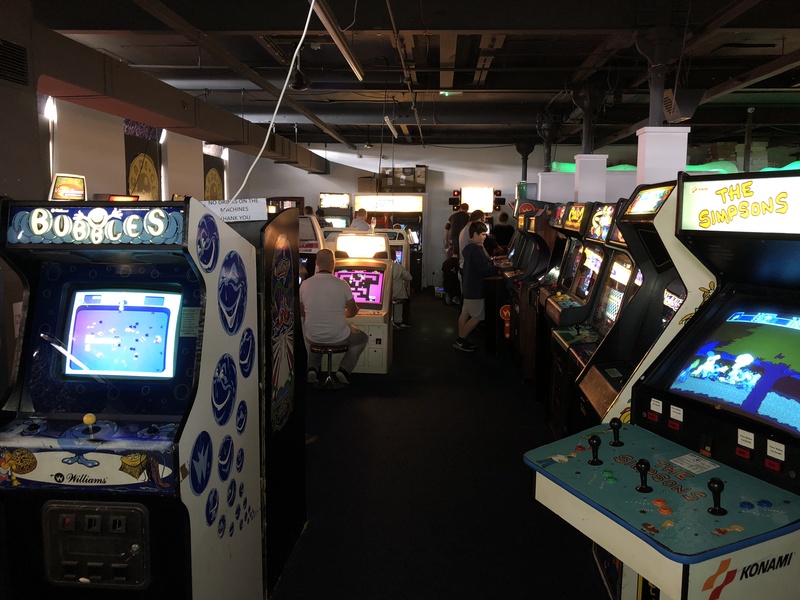 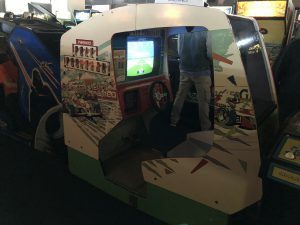 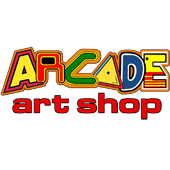 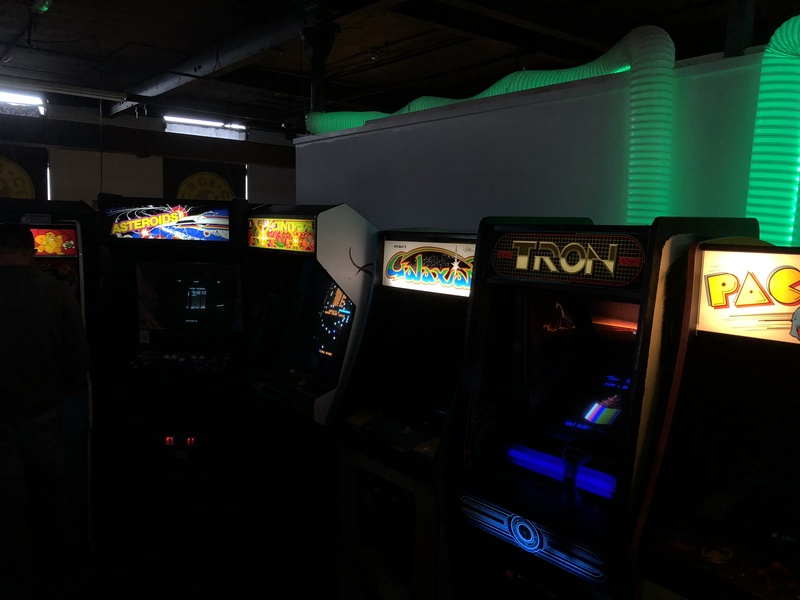 Once we were wrapped at Play Expo, it was time to load up and head over to the Arcade Club. 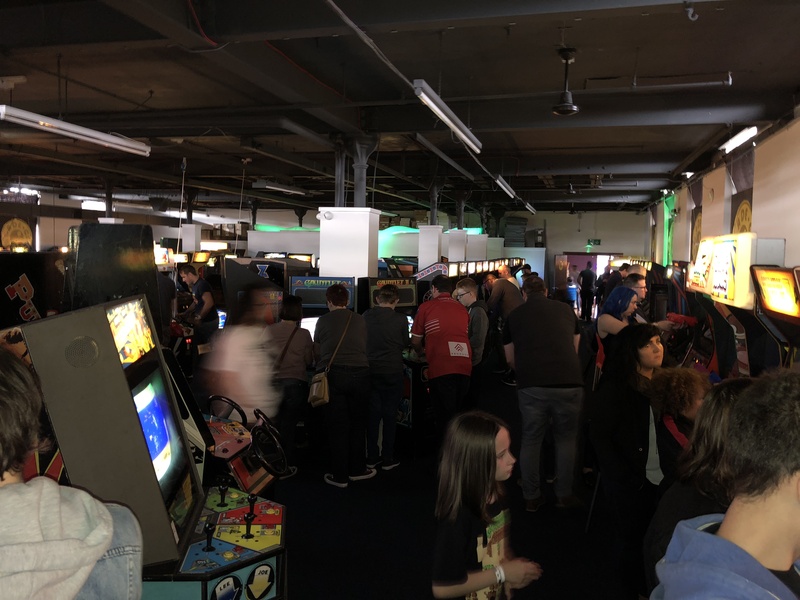 Traffic in the UK is….congested… and it took a fair amount of time to get from the Expo hall (in Manchester) to the Arcade Club building (in Bury) and we thought we might actually be late for our own event (!!) 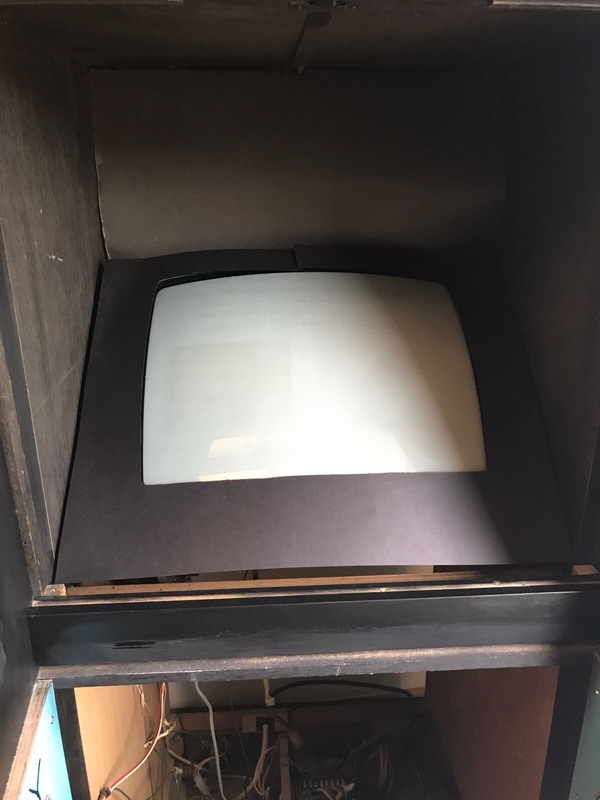 but everything worked out. 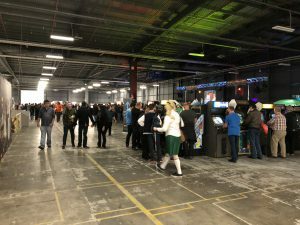 We arrived to a really good crowd that was already starting to assemble and as the evening wore on the number of people waiting for the reveal just kept going up and up. 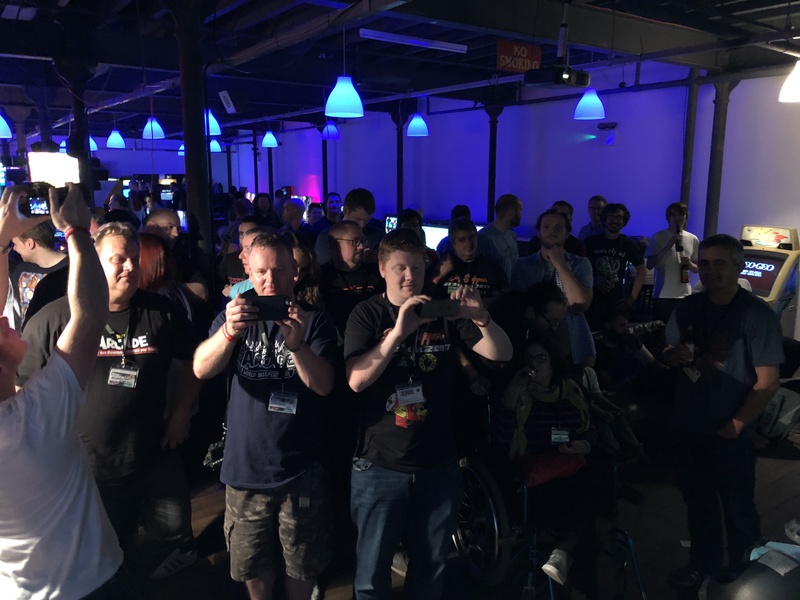 I was overjoyed at the turnout and the fact that so many people were so supportive of the work that we did for the project. Once 8:00p rolled around, it was time to make the magic happen! Alex and I took the stage and the whole scene was nothing short of electric. 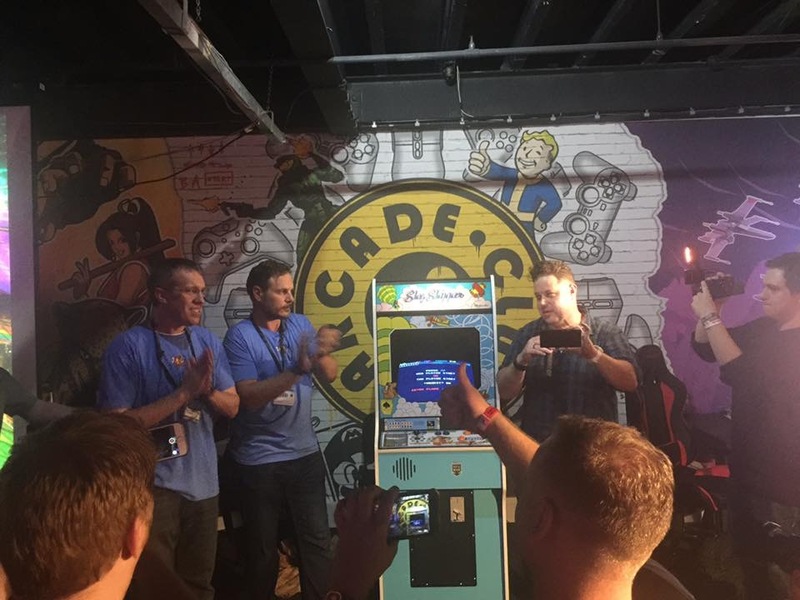 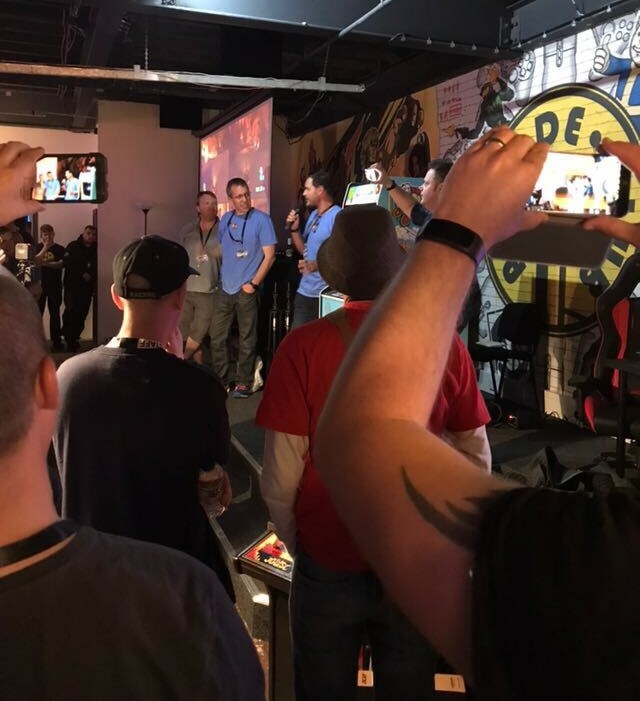 We had a nice lead-in and were joined by friend of the project John Jacobsen (blkdog7) on the stage for the reveal. 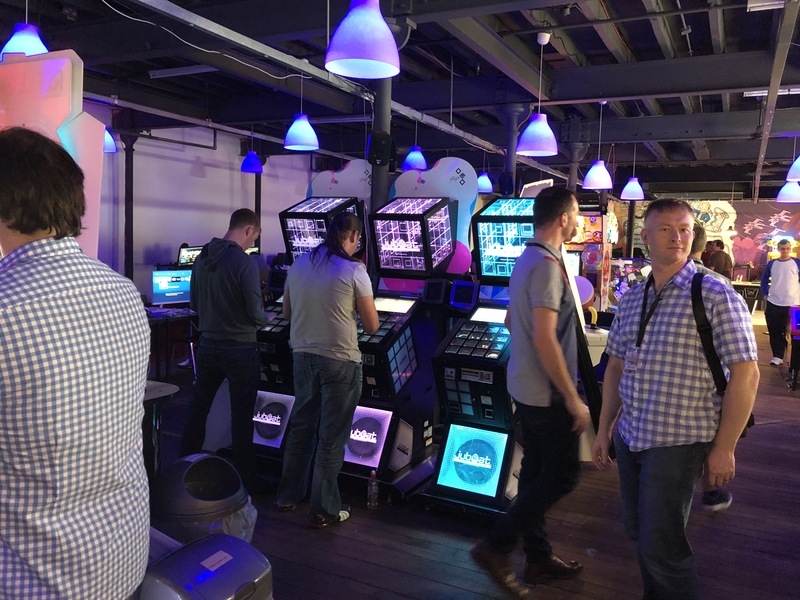 John did a fantastic job on the all-up video for the reveal event as well – check it out! 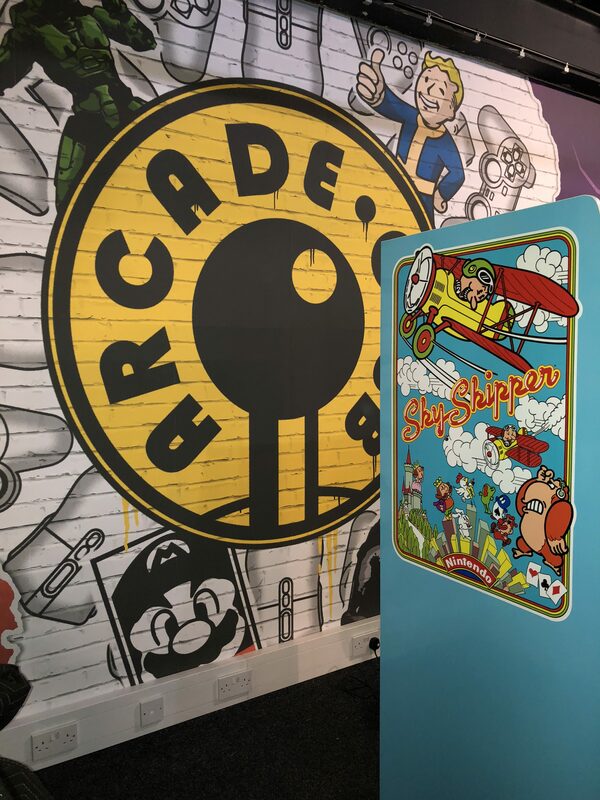 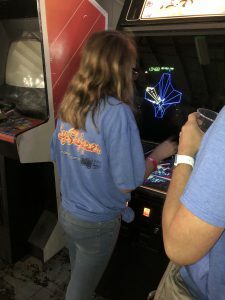 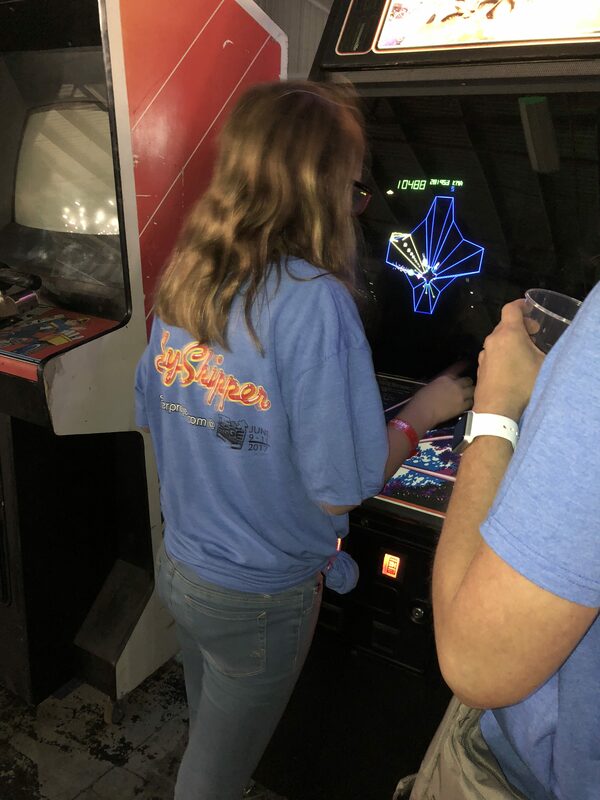 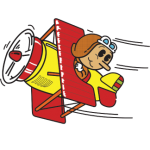 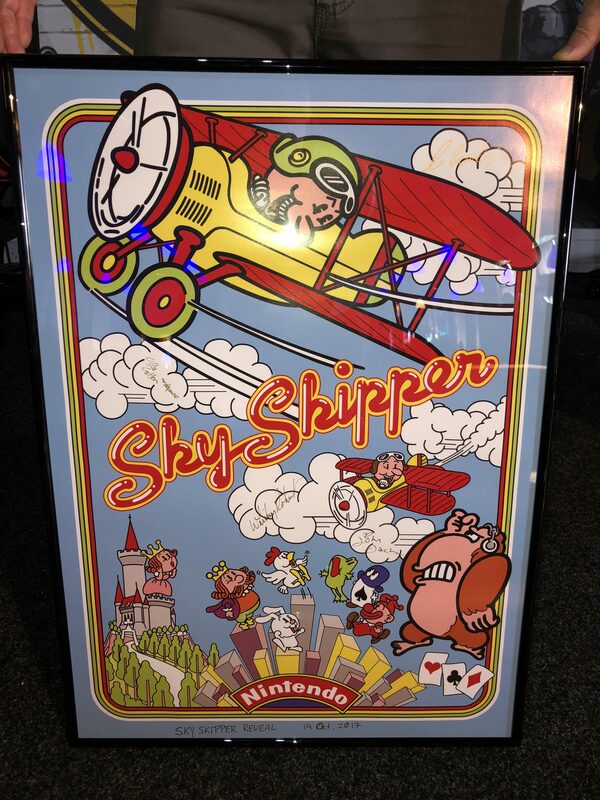 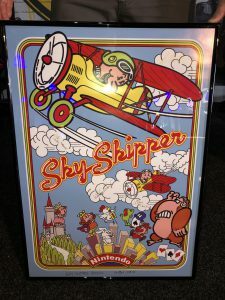 After the big event had wrapped, we made Sky Skipper available for free-play the rest of the evening and I will say – the queue to the game was never less than 8 or 9 people deep right up until the end of the night when the Arcade Club closed (1:00am). 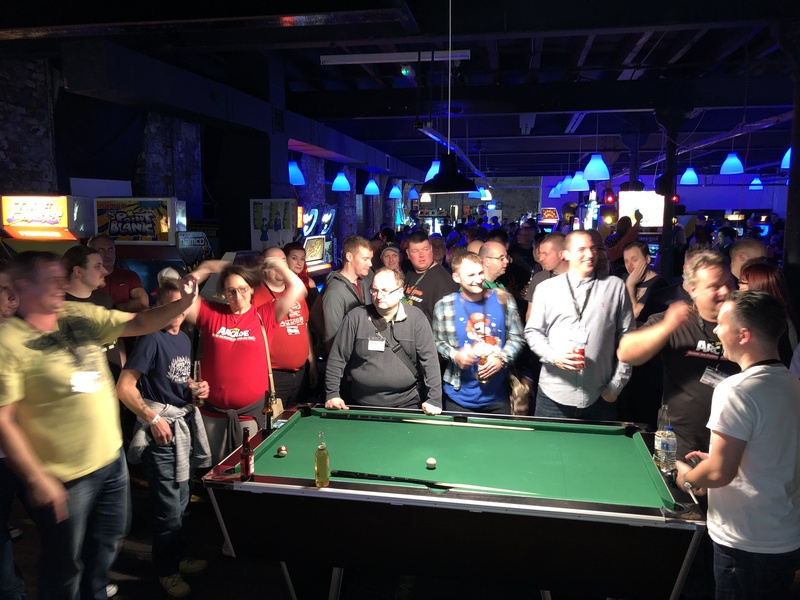 It was time for some fun and everyone had a great time – we can’t thank all the folks that took the time to show up and attend – you made a special night unforgettable! 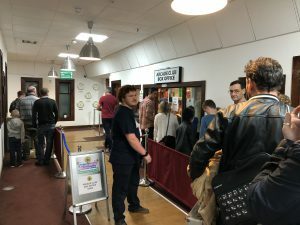 Sunday morning rolled around soon enough and we were on a schedule to get back to Twickenham by that evening. 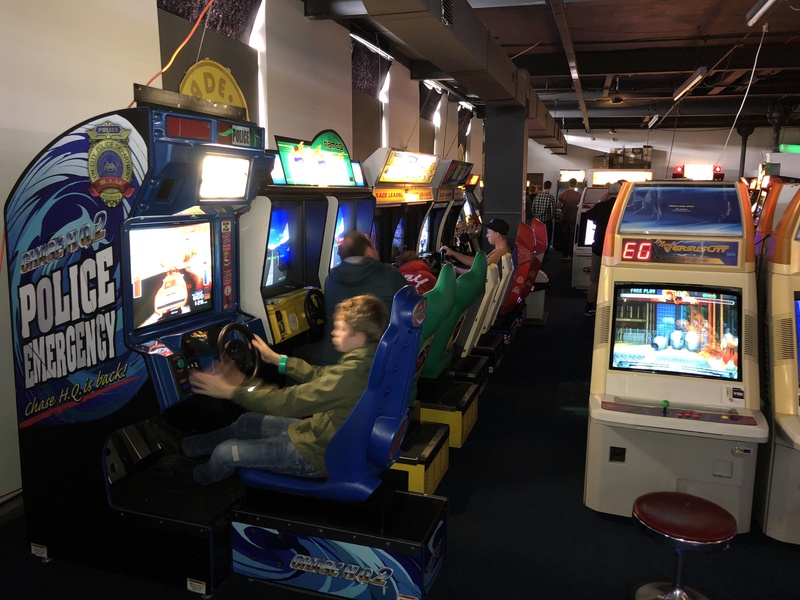 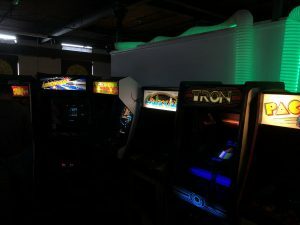 It’s a fairly long drive (time-wise) so we wanted to get up and going to ensure we had enough time to do a good walk-through tour of the Arcade Club facilities and grab some time for a photo shoot with everyone before we had to tear down and pack up. 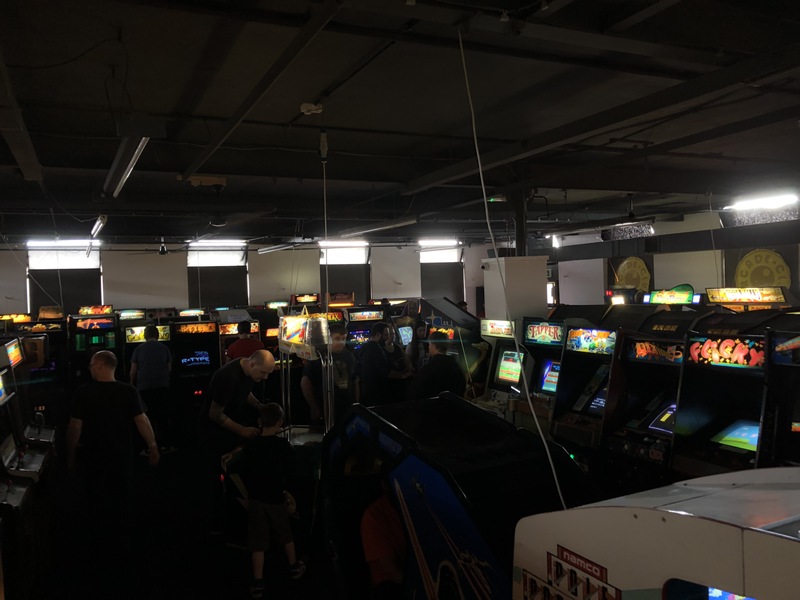 Check out what I can only call “the awesome sprawl” that is the Arcade Club… floor after floor and row after row of games! 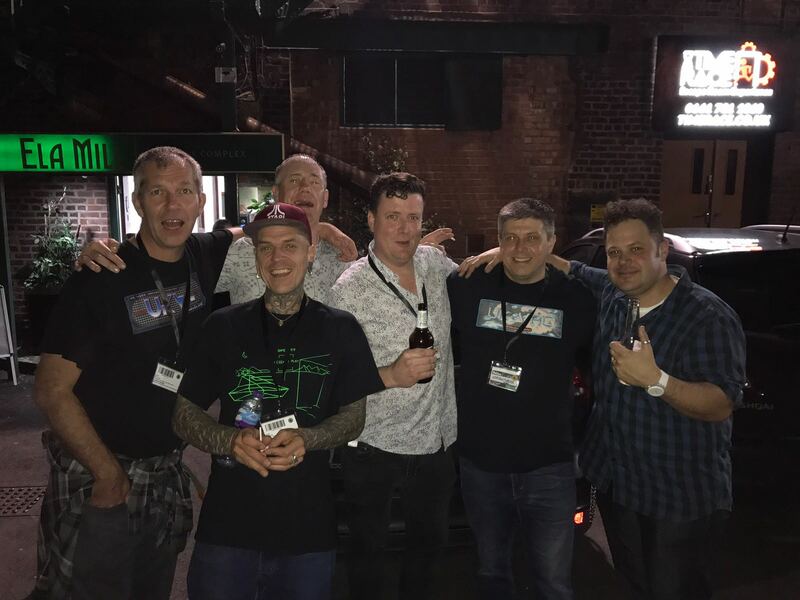 With just an hour or so to go before we had to hit the road back to Alex’s house, it was time to grab some “official” photos to commemorate the event. 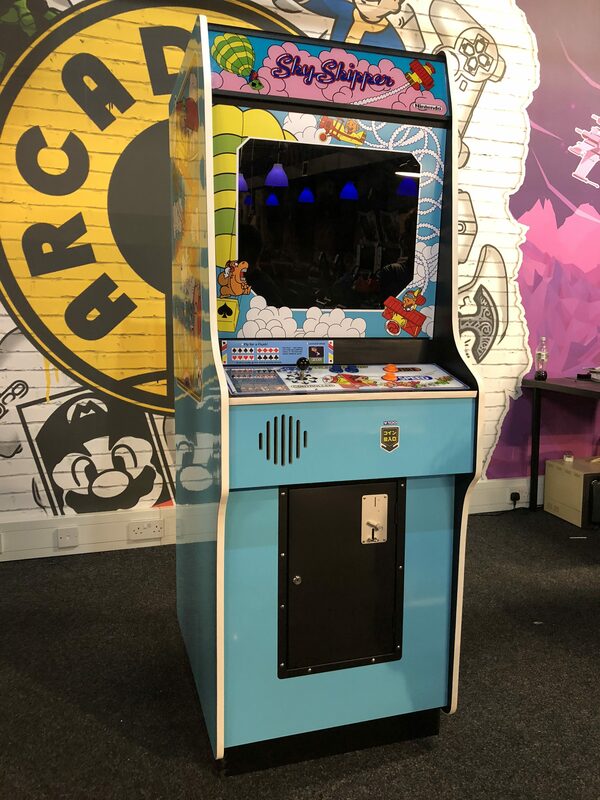 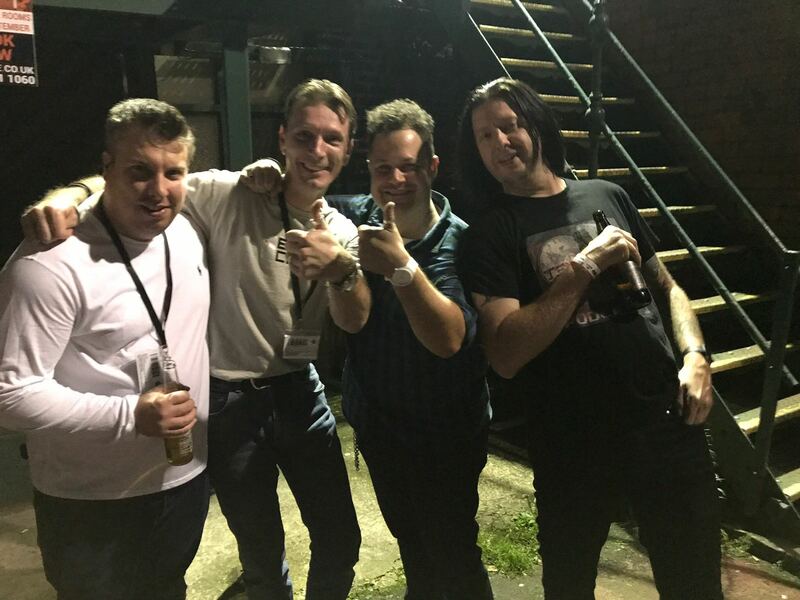 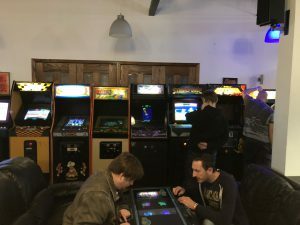 We were able to get some great shots of the cabinet on platform, as well as a few group photos with Andy (Arcade Club owner), Olly Cotton, Alex, myself and John Jacobsen. 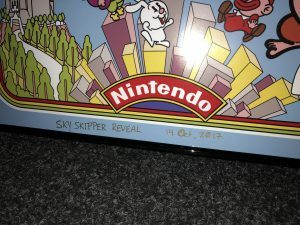 Olly had printed up a poster of the game side art and we all signed/dated it and then presented it framed to Andy as a “thank you” for hosting the event. In all – it was amazing. An utterly life-changing night that I’ll not soon forget and Alex and I have reminisced over this many, many times. 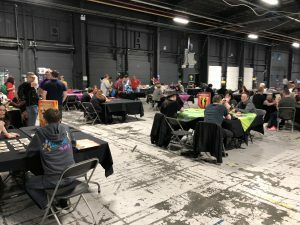 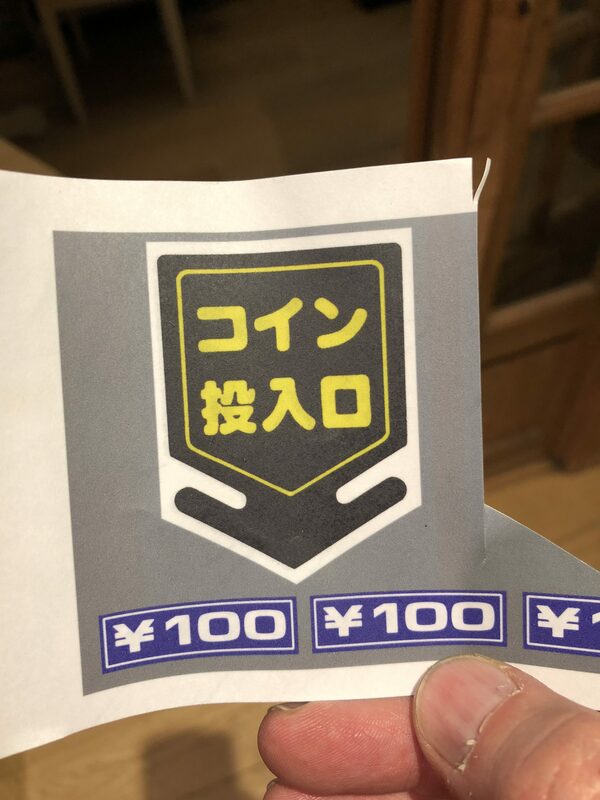 It’s made such a positive impact for both my family and the friends made through the course of the project that I just don’t see how anything hobby-related could have ever topped this. From both Alex and myself – thank you EVERYONE.